The glucocorticoid receptor (GR) potently represses macrophage-elicited inflammation, however, the underlying mechanisms remain obscure. Our genome-wide analysis in mouse macrophages reveals that pro-inflammatory paused genes, activated via global negative elongation factor (NELF) dissociation and RNA Polymerase (Pol)2 release from early elongation arrest, and non-paused genes, induced by de novo Pol2 recruitment, are equally susceptible to acute glucocorticoid repression. Moreover, in both cases the dominant mechanism involves rapid GR tethering to p65 at NF-kB-binding sites. Yet, specifically at paused genes, GR activation triggers widespread promoter accumulation of NELF, with myeloid cell-specific NELF deletion conferring glucocorticoid resistance. Conversely, at non-paused genes, GR attenuates the recruitment of p300 and histone acetylation, leading to a failure to assemble BRD4 and Mediator at promoters and enhancers, ultimately blocking Pol2 initiation. Thus, GR displays no preference for a specific pro-inflammatory gene class; however, it effects repression by targeting distinct temporal events and components of transcriptional machinery. Inflammation is one of the body’s responses to fight infection and heal tissue damage. The response is controlled by hundreds of genes, which fall into two classes. In the first class, an injury or infection triggers the enzyme RNA Polymerase to bind to and transcribe the gene into long RNA strands, which are then translated into the proteins that play a role in the inflammation response. The second class has a more quick-fire response. RNA Polymerase binds to these genes even without an injury or infection to serve as a trigger. But most of the time the enzyme only transcribes the beginning of these genes. This is because it is inhibited by a so-called negative elongation factor, which acts like a brake. For this second class of genes, an infection or injury triggers the release of the negative elongation factor from the enzyme, and allows RNA Polymerase to transcribe the full RNA strand. In excess, inflammation can be dangerous. The body’s way of limiting or controlling inflammation is via steroid hormones called glucocorticoids. These bind to the glucocorticoid receptor, which acts to switch off the inflammatory genes. But exactly how the receptor does this has not been fully understood. Sacta et al. investigated how the glucocorticoid receptor turns off these gene complexes. Experiments looking at white blood cells in mice found that the receptor can switch off both groups of inflammatory genes, but by a different mechanism for each class. Sacta et al. discovered that in the first gene class, the receptor blocks proteins that open up the DNA for RNA Polymerase, so it could not bind to the gene. In the second class, the receptor stops the release of the brake-like negative elongation factor from RNA Polymerase. As a result, the enzyme stalls at the beginning of the gene and fails to make a full-length transcript required to make the necessary protein. Glucocorticoids are often used as drugs to treat chronic inflammation, but they can have debilitating side effects. Understanding how the glucocorticoid receptor switches off inflammatory genes could help to design drugs with fewer side effects to treat chronic inflammation, and diseases caused by specific inflammatory genes. Inflammation is an innate immune response to tissue injury or infection. It relies on macrophages, which recognize pathogen-associated molecular patterns and other ‘danger’ signals via their toll-like receptors (TLRs) (Glass and Saijo, 2010). This initiates a signaling cascade that leads to the activation and DNA binding of the effector transcription factors NF-kB and AP1 (O'Neill et al., 2013) which recruit coregulators, and, ultimately, the basal transcription machinery that together alter the chromatin state in the vicinity of many pro-inflammatory genes and enable their transcription (Smale and Natoli, 2014; Glass and Natoli, 2015). Acute transcriptional activation of pro-inflammatory genes is, therefore, critical for overriding the homeostatic set-point and producing a robust immune response that helps to resolve infection or tissue injury (Kotas and Medzhitov, 2015). Although the magnitude and dynamics of inflammation is affected at multiple levels, the temporal coordination of cytokine gene transcription by RNA Polymerase (Pol) 2 is a key mechanism that defines acute inflammatory response. The Pol 2 transcription cycle has been divided into three phases: initiation, elongation and termination. Initiation involves the recruitment of Pol 2 to the promoter, histone modifications and changes in histone occupancy. In addition, the C-terminal domain (CTD) of Pol 2, which contains multiple heptad repeats (YS2PTS5PS), is phosphorylated at S5, and Pol 2 synthesizes short (20–60 nt) RNA transcripts. During the elongation step, Pol 2 is further phosphorylated at S2 by the cyclin T1/CDK9 positive transcription elongation factor (P-TEFb) and synthesizes the full length RNA transcript, which is followed by the termination step and RNA transcript dissociation from the DNA (Nechaev and Adelman, 2011). Although Pol 2 recruitment and initiation has been historically considered the rate-limiting step in signal-dependent transcription, numerous recent studies revealed that transcriptionally engaged Pol 2 often remains paused near promoters in the absence of activating signal and that entry into productive elongation is rate-limiting for activation of up to 40% of inducible genes (Core et al., 2012). The paused Pol 2 is in a complex with the 4-subunit negative elongation factor (NELF); NELF phosphorylation by P-TEFb leads to its release and Pol 2 entry into productive elongation (Chiba et al., 2010; Nechaev and Adelman, 2011). A subset of cytokine genes in macrophages is controlled at the level of Pol 2 pausing. Indeed, while for genes such as Il1a and Il1b, signal-dependent Pol 2 recruitment to their transcription start sites (TSS) and transcription initiation are rate-limiting, other genes, exemplified by Tnf, are occupied by Pol 2 even under resting conditions (Adelman et al., 2009; Hargreaves et al., 2009; Gupte et al., 2013). At Tnf, Pol 2 is S5-phosphorylated, bound by NELF and paused ~50 bp downstream of the TSS. Pause release following S2 and NELF phosphorylation by P-TEFb occurs in response to inflammatory signal. Aside from Pol 2 occupancy, the chromatin state plays an integral part in the regulation of transcription (Smale et al., 2014). In particular, histone code ‘writers’ such as acetyltransferases (HATs) GCN5 and p300 have been implicated in modifying H3K9/14 and H4K5/8/12 at inflammatory genes in macrophages following treatment with TLR4 ligands (Hargreaves et al., 2009; Escoubet-Lozach et al., 2011). Both HATs are recruited by the NF-kB subunit p65 to regulatory regions in a stimulus-dependent manner (Hargreaves et al., 2009; Ghisletti et al., 2010). Histone modifications are then bound by ‘readers’ such as BRD4, a protein containing two conserved N-terminal bromodomains (BD1 and BD2), which associates with most active promoters and some active enhancers, and has been proposed to couple the acetylation state at enhancers and promoters with Pol 2 elongation (Lovén et al., 2013; Brown et al., 2014). BRD4 occupancy correlates with acetylation marks at H4K5/8/12, H3K9/27 (Lovén et al., 2013; Kanno et al., 2014; Nagarajan et al., 2014) and with gene activation, whereas chemical inhibition of BRD4 binding abrogates the induction of a subset of genes (Nicodeme et al., 2010). Furthermore, BRD4 has been shown to associate with P-TEFb, affecting Pol 2 CTD phosphorylation, and hence, transcription elongation (Itzen et al., 2014). These events coalesce ensuring a rapid remodeling of the inflammatory transcriptome, with hundreds of genes undergoing a dramatic upregulation (Escoubet-Lozach et al., 2011; Chinenov et al., 2012; Gupte et al., 2013; Uhlenhaut et al., 2013; Tong et al., 2016). Although essential for host defense, unabated inflammation imposes a threat to the host and can result in tissue damage and autoimmunity. One systemic mechanism that controls acute inflammatory response is a feedback loop whereby inflammatory cytokines trigger the production of steroid hormones known as glucocorticoids (GCs) (reviewed in [Sacta et al., 2016]). Lipophilic GCs diffuse through the cell membrane and bind the intracellular glucocorticoid receptor (GR), a transcription factor (TF), which then translocates to the nucleus and regulates gene expression. The transcriptional outcomes of GR activation are context-specific and are determined by the genomic GC response elements (GRE) to which the receptor binds. GR can bind directly to specific, usually pseudopalindromic, DNA sequences either as a homodimer or complexed with other TFs such as AP1 and STAT3 (Biddie et al., 2011; Langlais et al., 2012). In this context, GR recruits various coregulators such as members of the p160 family, HATs, the Mediator complex and ATP-dependent chromatin remodelers (Weikum et al., 2017b), ultimately leading to the activation of numerous genes including the anti-inflammatory genes, such as Dusp1 and Tsc22d3 (GILZ). At other sites, known as ‘tethering’ GREs, GR does not directly bind DNA but interacts with other DNA-bound TFs such as pro-inflammatory AP1 and NF-kB and usually represses their activity (reviewed in [Chinenov et al., 2013]) – a property fundamental to the ability of GCs to dramatically attenuate inflammation. In contrast to GR-mediated activation, the mechanisms of transcriptional repression by GR remain poorly understood. Strikingly, however, in a few cases analyzed, genes activated through Pol 2 recruitment and those induced by signal-dependent Pol 2 pause release were both susceptible to GR-mediated repression (Gupte et al., 2013). Here, we use a combination of cell-based and genome-wide approaches to elucidate the mechanisms by which GR represses pro-inflammatory genes in primary macrophages challenged acutely with the TLR4 agonist lipopolysaccharide (LPS) and GCs. We present evidence of ‘tethering’ as a prevalent mechanism of repression among p65/GR co-regulated genes. We further demonstrate a widespread yet gene class-specific role of NELF in glucocorticoid-mediated repression of early elongation. Conversely, at other genes, GR precludes the ordered assembly of HATs, Brd4 and the Mediator complex which ultimately blocks Pol 2 recruitment and transcription initiation. To understand the mechanisms by which GR elicits its repressive effects, we first assessed by RNA-seq the global transcriptional changes upon acute activation of primary mouse bone-marrow-derived macrophages (BMDM) with LPS or LPS together with a synthetic GC dexamethasone (Dex) for 1 hr. At FDR < 0.1 we found that, compared to vehicle-treated BMDM, 597 genes were induced by LPS >1.5 fold. Of these, the induction of 201 genes was attenuated >1.3 fold by Dex co-treatment (Figure 1A and Supplementary file 1). As expected, GO analysis of acutely GR-repressed genes revealed predominantly those involved in cytokine signaling (Figure 1A). GR represses LPS-induced genes via p65-assisted tethering. (A) Over 30% of LPS-induced genes (597) in BMDM are repressed by Dex (201; Venn diagram and normalized expression values) and show a pro-inflammatory gene signature (GO analysis). BMDM were untreated (U) or treated with 10 ng/ml LPS ±100 nM Dex (L and LD) for 1 hr, and gene expression levels were determined by RNA-seq (n = 2). (B) The overlap between ChIP-seq peak calls for GR and p65 in LPS + Dex-treated BMDM (Venn diagram) was determined using subsetByOverlap function from GenomicRanges package (Bioconductor) with the minimum overlap of 1 nt (see Materials and methods). Ab initio sequence motif discovery and over-representation in each subset of GR or p65 binding peaks was determined using MEME-ChIP (Ma et al., 2014). E-values for the enrichment of the motif are shown. (C) Dex- and LPS + Dex-induced GR ChIP-seq peaks are shown (Venn diagram). LPS + Dex unique peaks are enriched for NF-kB-binding sites as indicated by MEME-ChIP analysis as in B. (D) Genomic location of p65 and GR binding sites relative to known genomic features is determined by ChIPpeakAnno (Bioconductor) (Zhu et al., 2010). (E) The distribution of GR-binding sites located in a 200 Kb region centered on LPS-induced Dex-repressed genes in BMDM treated with Dex or LPS + Dex (left). Pie-charts show the % of LD-unique GR peaks either genome-wide (center) or those associated with LPS-induced Dex-repressed genes only (right). (F) GR and p65 ChIP-seq read density profiles of representative LPS-induced Dex-repressed genes are shown for untreated (U), LPS (L) or LPS + Dex (L + D) treated BMDM. Also see Figure 1—figure supplements 1–2 and Supplementary files 1 and 2. Despite rapid remodeling of the macrophage LPS-induced transcriptome in response to Dex observed by us and others (Figure 1, [Rao et al., 2011; Chinenov et al., 2012; Uhlenhaut et al., 2013; Chinenov et al., 2014]), no comprehensive analysis of the GR and p65 genome-wide occupancy under acutely repressing conditions has been reported. Therefore, we determined the distribution of p65 and GR genomic binding sites in BMDM pulsed with LPS, Dex or LPS + Dex for 45 min (see Figure 1—figure supplements 1–2 and Supplementary file 2 for quality metrics and comparison of replicates). Following LPS + Dex exposure, we detected 9987 GR peaks (union of two replicates) 5397 (54.1%) of which did not overlap with p65 peaks at the same conditions (Figure 1B, top, Figure 1—figure supplement 1A). Motif overrepresentation analysis in these GR unique peaks revealed predominance of centrally enriched NR3C-binding motifs, which represent GREs and highly related NR-binding sites, those for ETS family members, such as the macrophage lineage-determining TF SPI1 (PU.1 and SPIB), and AP1 family members (Figure 1B, Figure 1—figure supplement 1B, left panel). The analysis of p65 binding after LPS + Dex treatment revealed 7052 peaks (union of two replicates) of which 2344 (33.8%) were uniquely bound by p65 (Figure 1B, Figure 1—figure supplement 2A). Motif analysis indicated an enrichment of NF-kB/Rela binding motifs, as well as ETS and AP1 motifs (Figure 1B). Importantly, the GR and p65 cistromes shared 4589 peaks, which corresponds to nearly half of all GR- and 2/3 of all p65-binding peaks. Motif analysis of these peaks showed a predominance for NR3C/GRE, ETS family, NF-kB/Rela and AP1 binding motifs that were enriched near the peak summits (Figure 1B, bottom, Figure 1—figure supplement 1B, middle panel). Because of the significant enrichment of peaks with NF-kB elements (especially among those overlapping p65-binding peaks) in the GR cistrome under repressing conditions, we performed GR ChIP-seq in BMDM treated with Dex only for 45 min to compare the two GR cistromes. In Dex-treated BMDM, GR-binding sites formed 3377 peaks. Of those, 3165 also appeared in the GR LPS + Dex cistrome (with only 212 peaks unique to Dex-treated BMDM), whereas 6817 were gained in the GR LPS + Dex cistrome (Figure 1—figure supplement 1A, right panel). ETS and NR3C-binding motifs were over-represented in both Dex-unique and Dex – LPS + Dex shared subsets of GR peaks and trended toward the peak summit (Figure 1C, Figure 1—figure supplement 1B, right panel). We did not detect NF-kB/Rela motif enrichment in these two subsets of GR-binding peaks. However, among 6817 peaks unique to the GR LPS + Dex cistrome we readily observed an overrepresentation of NF-kB and AP1 motifs while NR3C motifs were no longer enriched (Figure 1C, compare top/middle vs. bottom motif enrichment panels) indicating that inflammatory signaling and p65/NF-kB activation was driving GR recruitment to such sites specifically under repressing LPS + Dex conditions. The majority of GR and p65-binding sites were located in distal intergenic (~39–47% of peaks) and intronic (~40% on average) regions (Figure 1D), similar to previously reported GR and p65 cistromes in various cell lines (Reddy et al., 2009; Barish et al., 2010). To correlate GR binding with transcriptional outcomes, we focused on our subset of 201 LPS-induced Dex-repressed genes as determined by RNA-seq (Figure 1A, Supplementary file 1) and evaluated GR peak localization within these genes and 100 Kb of their 5’- and 3’-flanking regions in Dex- and LPS + Dex-treated BMDM. In this subset, a somewhat larger fraction (~52%, compared to 39–47% genome-wide) of GR-binding peaks were located in distal intergenic regions, whereas the fraction of peaks in the introns dropped from 40% to 24% compared to whole-genome GR cistrome (Figure 1D). This shift was not due to a preponderance of shorter introns or genes in Dex-repressed subset (Figure 1—figure supplement 1C). Comparison of GR binding near the 201 Dex-repressed genes with an entire GR cistrome shows that a greater fraction of binding sites was unique to the LPS + Dex condition (81% vs. 68%, Figure 1E) consistent with a disproportional increase in unique binding site utilization among this functionally constrained set of genes. Several representative examples of GR and p65 co-binding near GR-sensitive genes are shown in Figure 1F: at each gene, GR binding occurred at sites matching those of p65, but only in LPS + Dex and not LPS- or Dex-alone treated BMDM. Importantly, LPS-dependent p65 binding fully persisted in the presence of Dex. In fact, the total number of p65 binding peaks in the presence of LPS and LPS + Dex was comparable both genome-wide, and in the vicinity of our GR-repressed genes (Figure 1—figure supplement 2A, right and 2B). In each case, ~2/3 of the LPS-induced p65 peaks persisted in LPS + Dex-treated BMDM. Moreover, among p65 LPS + Dex peaks functionally constrained to Dex-repressed genes, 80% (up from 68% genome-wide) overlapped LPS-induced peaks (Figure 1—figure supplement 2C). Interestingly, of the 201 genes repressed by Dex in the context of LPS-mediated macrophage activation, only 56 were repressed ≥1.3 fold (and only 16 of those ≥2 fold) upon treatment with Dex alone (Supplementary file 1; RNA-seq dataset from [Chinenov et al., 2014]) – further supporting a requirement for NF-kB activation for GR recruitment to the majority of genes Dex-sensitive genes. Combined, these results further corroborate a tethering model in which p65 is a central component of repression complexes in GC-treated BMDM. 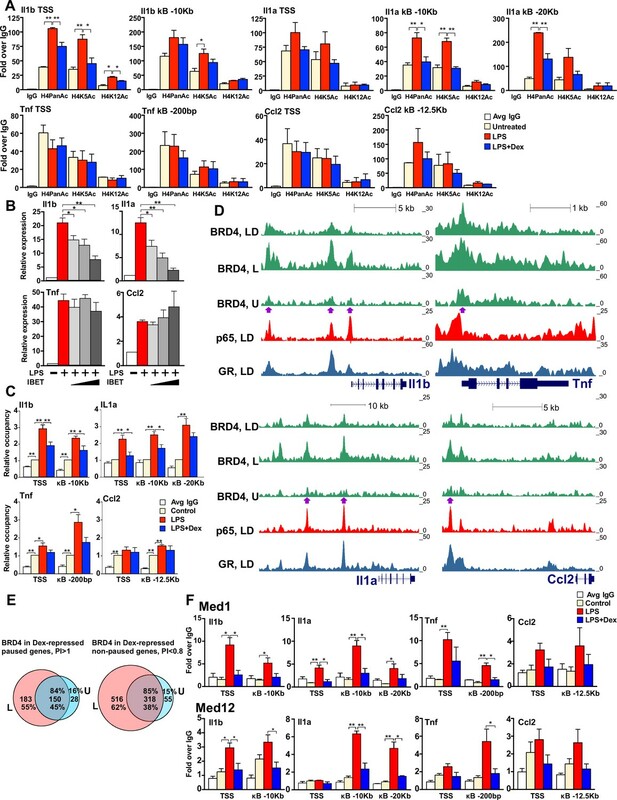 We have reported that at several pro-inflammatory genes in unstimulated BMDM, promoter-proximally paused Pol 2 is in a complex with NELF and enters productive elongation following LPS treatment (Adelman et al., 2009; Gupte et al., 2013). To assess how common this type of Pol 2 dynamics is among inflammatory genes, we performed Pol 2 ChIP-seq in untreated, LPS- or LPS + Dex treated BMDM. Figure 2A shows Pol 2 tracks for six genes all of which were among 201 that were rapidly induced by LPS and repressed by Dex as established by RNA-seq (Figure 1A). Of those, Tnf, Hilpda and Btg2, all display accumulation of Pol 2 near the TSS in untreated BMDM. Upon a 45-min LPS treatment, we detect additional Pol 2 loading and, notably, its redistribution into the body of the gene; conversely, upon LPS + Dex treatment, Pol 2 largely remains near the TSS resembling a ‘paused’ pattern seen in the unstimulated BMDM (Figure 2A, left). In contrast, non-paused genes Il1a, Il1b and Cd83 display no substantial Pol 2 occupancy in the unstimulated BMDM, and a dramatic and uniform increase in Pol 2 occupancy throughout the gene in response to LPS, which is nearly abrogated by co-treatment with Dex (Figure 2A, right). Pol 2 and NELF dynamics at different classes of GR-sensitive genes. (A) Pol 2 ChIP-seq read density profiles and pausing indexes (PI) for representative paused and non-paused genes in the untreated (U), LPS (L) and LPS +Dex (LD) treated BMDM. (B) PI (a ratio of Log-transformed Pol 2 counts at the promoter and gene body in untreated BMDM) was calculated for all LPS-induced Dex-repressed transcript variants with unique 5’ ends (see Materials and methods). Genes with PI >1 were considered paused and those with a PI <0.8 non-paused. (C) Pol 2 ChIP-seq heat maps of paused (n = 62) and non-paused (n = 82) transcripts sorted by the PI indexes corresponding to 198 Dex-repressed genes (see Materials and methods) are shown for the U, L and L + D conditions for each individual replica. Only transcripts overlapping Pol 2 peaks in LPS-treated BMDMs as determined by MACS2 are shown. NELF-E heat maps from U BMDM ChIP-seq for the same transcript classes are shown on the right. Heat maps scales are equalized to visualize Pol 2 and NELF distribution across the genes; color scale bars are shown below corresponding maps. (D) Average Pol 2 (in each treatment condition) and NELF-E (untreated BMDM) occupancy for each gene class defined in C. The confidence band shows the SEM and 95% confidence interval. Also see Supplementary files 2 and 3. These findings raised the possibility that GR mediates its repressive effects genome-wide by regulating distinct steps of Pol 2 transcription cycle depending on the rate-limiting step for gene activation. To address this possibility, we first calculated Pol 2 pausing indexes (PI) for approximately 300 transcripts corresponding to our 198 LPS-induced Dex-repressed genes (three genes were excluded due to the conflict of annotation). As described in Nechaev et al. (2010), we defined PI as the ratio of log-transformed normalized Pol 2 counts around the promoter (−200/+500 bp relative to the annotated TSS) to those within the gene body downstream of +500 bp (Figure 2B, Supplementary file 3). Based on the PI in untreated BMDM, we classified GC-repressed genes into two groups: 61 transcripts had a PI >1 and were considered to be paused (twice as much of Pol2 at the promoter region versus gene body), whereas 82 had a PI <0.8 and were considered non-paused (see Materials and methods and [Nechaev et al., 2010]). Figure 2C shows Pol 2 distribution within the −200/+1500 region for individual transcripts of both classes in unstimulated BMDM, as well as BMDM exposed for 45 min to LPS or LPS + Dex. The read density distribution for 61 paused and 82 non-paused transcripts in differentially treated BMDM (Figure 2D) reveals a peak of Pol 2 occupancy in the promoters of the paused genes, additional Pol 2 loading, and, importantly, its entry into gene bodies in response to LPS. Co-treatment with Dex decreases Pol 2 occupancy in gene body with most Pol 2 remaining near the TSS (Figure 2C and D). Conversely, little Pol 2 is seen in the non-paused genes in untreated BMDM; Pol 2 occupancy increases dramatically throughout the genes in LPS-treated BMDM and this loading is largely abrogated by Dex (Figure 2C and D), consistent with the pattern shown in Figure 2A for representative genes. Because Pol 2 pausing within the first 100 nt of a gene is mediated by NELF (Adelman and Lis, 2012), we assessed genome-wide NELF distribution by ChIP-seq using antibodies to the NELF-E subunit of the complex. Aligned with Pol 2 PI heat maps, NELF-E occupancy matched closely Pol 2 distribution in untreated BMDM with striking accumulation immediately downstream of TSS of paused genes and little to no NELF-E seen in non-paused genes (Figure 2C and D, far right). Indeed, read density distribution in NELF-E ChIP-seq shows highly gene class-specific NELF-E occupancy at paused (PI >1) promoters (Figure 2D, right). As reported previously for a few individual genes (Adelman et al., 2009; Schaukowitch et al., 2014), following LPS stimulation, NELF-E was broadly evicted from promoters of LPS-induced genes with little occupancy detected at 1 hr (Figure 3A). Interestingly, however, this dismissal was transient, as despite continued LPS exposure, NELF reloaded onto promoters reaching widespread occupancy by 3 hr (Figure 3A, also see average occupancy graphed for all paused transcripts). This release and reloading can be seen at specific paused GC-sensitive genes, Tnf, Hilpda, and Btg2 (Figure 3A, right), which show substantial NELF-E occupancy at the TSS co-localizing with Pol 2 peaks in resting BMDM, its dissociation following a 1 hr LPS induction, and re-establishment of the TSS-associated NELF-E peaks by 3 hr. Gene-class-specific contribution of NELF to GR-mediated repression. (A) Heat maps show NELF-E occupancy in the U (from Figure 2C), 1 and 3 hr L-treated BMDM for paused and non-paused transcripts. Average occupancy for the paused genes in each condition is graphed as in Figure 2D. Representative examples of Pol 2 and NELF ChIP-seq read density profiles are shown on the right. (B) Pie charts show the percentage of all paused (24%) and non-paused (66%) LPS-induced Dex-repressed genes that exhibit promoter-proximal NELF-E binding in the UNT (86.3% and 31.7%, respectively) and L + D conditions (83.6% and 33.2%, respectively). NELF-E ChIP-seq read density profiles for the L + D condition are shown for a set of representative genes. Red rectangles in Tnf, Myc, Errfi1 and Ccl2 profiles indicate MACS2 NELF-E peaks in the L + D condition. (C) NELF-B KO mice were generated as described in Methods. NELF-B RNA in WT and KO BMDM was quantified by RT-qPCR and normalized to Actb (n = 5, p<0.0001, two-tailed Student’s t-test; error bars are SEM). For western blots, three mice per genotype were used to visualize NELF-B, NELF-E and HSP90 as a loading control (top). Bottom: WT and NELF-B KO BMDM were U or treated with L-/+D for 30 min (Tnf) or 1 hr (all others) and the expression of indicated genes (matching those in B) was assessed by RT-qPCR, normalized to Actb, and shown as ‘fold activation by LPS’ over basal levels (=1) and ‘fold repression by Dex’ (a ratio of L over L + D level of each transcript). *p<0.05, **p<0.01 (Two-tailed Student’s t-test). Error bars are SEM. (D) The volcano plot comparing gene expression in L + D (1 hr) treated BMDM from the WT vs. NELF-B KO mice (n = 3) (fold change = 1.5, FDR p<0.05). Pausing indices (PI) of 201 LPS-induced Dex-repressed genes from Figure 1A are shown in color. (E) CDK9 occupancy at selected genes in BMDM treated for 1 hr as indicated. n = 4–9. **p<0.01, ****p<0.001 (two-tailed Student’s t-test). Error bars are SEM. Also see Figure 3—figure supplement 1 and Supplementary file 2. To directly assess whether NELF occupancy in GC-sensitive genes in BMDM correlates with Pol 2 pausing in early elongation, we compared the NELF-E and Pol 2 cistromes in the unstimulated BMDM. Among the LPS-induced Dex-sensitive genes with PI >1 (approximately 24% of 300 Dex-repressed transcripts), 86.3% displayed promoter-associated NELF-E peaks, compared to only 31.7% in genes with PI <0.8 (which comprised approximately 66% of 300 transcripts; Figure 3B, left). Importantly, similar relative numbers of paused and non-paused genes (23% and 70%, respectively; Figure 3—figure supplement 1B) were found among LPS-induced Dex-insensitive genes from RNA-seq (Figure 1A). In this group, NELF-E occupancy in untreated BMDM was again much more prevalent in paused genes (81.1%) than in non-paused ones (44.2%). Thus, GR does not preferentially repress genes in one class vs. the other, and high levels of TSS-associated NELF in a basal state is a common feature of paused genes irrespective of their sensitivity to GC. Given that NELF and Pol 2 co-localize at the TSS of the paused genes in unstimulated BMDM, that activation of such genes by LPS coincides with NELF dismissal, and that Pol 2 remains near the promoters of these genes under repressing conditions consistent with their early elongation arrest, we questioned whether GR-mediated repression was globally mediated by NELF. We first evaluated NELF-E occupancy in BMDM co-treated with LPS + Dex by ChIP-seq and found the relative distribution of peaks among paused (PI >1) and non-paused (PI <0.8) repressed genes to be indistinguishable from NELF-E distribution in resting BMDM (83.6% and 33.2%, respectively; Figure 3B, right – compare to left). We then evaluated NELF-E distribution across several of our target genes in the presence of LPS + Dex and detected striking promoter-proximal NELF peaks in paused Tnf, Myc, Errfi1 and Ccl2, but not in non-paused Il1b or Lif (Figure 3B). To address directly whether NELF is necessary for GR-mediated repression, we used a new mouse strain conditionally lacking the NELF-B subunit and, hence, the functional NELF complex in myeloid cells (see Materials and methods). BMDM from NELF-B LysM-Cre mice (NELF-B KO) show a dramatic reduction in NELF-B mRNA and protein (Figure 3C, top). Importantly, as the NELF complex requires all four subunits for stability and the loss of a single subunit leads to the proteolytic degradation of the complex (Gilchrist et al., 2008), immunoblot also reveals a near complete loss of the NELF-E protein in the BMDM of the NELF-B KO (Figure 3C, top). Using WT and NELF-B KO BMDM, we then compared GR-mediated repression of our candidate GC-sensitive genes. Consistent with the lack of overt phenotype in these mice, RNA-seq of resting BMDM of the two genotypes revealed no significant differences in the expression levels of LPS-induced Dex-repressed genes at baseline (Figure 3—figure supplement 1C). Moreover, at the time-frame examined, LPS challenge led to a similar induction of Tnf, Myc, Errfi1, Ccl2, Il1b and Lif transcripts irrespective of the genotype (Figure 3C, bottom left). Interestingly, for all genes classified as ‘paused’, repression by Dex was significantly attenuated in the NELF-B KO BMDM, but not in non-paused genes Il1b and Lif (Figure 3C, bottom right). Collectively, these findings strongly suggest that NELF-mediated block in productive elongation is an integral part of GR-mediated repression of paused genes. To extend these observations to a whole-genome level, we analyzed transcriptomes from the WT and NELF-B KO BMDM treated with LPS + Dex for 1 hr by RNA-seq which identified 393 differentially expressed genes (fold change = 1.5, FDR p<0.05). Out of 201 genes that were repressed by Dex in the WT BMDM (Figure 1A), 23 were expressed at higher level in the LPS + Dex-treated NELF-B KO BMDM; notably, 21 of them had PI >0.8 (Figure 3D). Conversely, out of 396 LPS-induced Dex-insensitive genes, only nine were upregulated in the LPS + Dex-treated NELF-B KO BMDM, 7 of which had PI >0.8 (Figure 3—figure supplement 1D, left). These observations indicate that NELF ablation disproportionally affects paused LPS-induced Dex-repressed genes. Because NELF release is triggered by CDK9-mediated phosphorylation, we evaluated the recruitment of CDK9 to the TSS of paused and non-paused genes. Consistent with earlier observations (Luecke and Yamamoto, 2005), GR inhibited LPS-induced CDK9 recruitment but did so irrespective of the gene class (Figure 3E) suggesting that NELF retention rather than CDK9 occupancy serves as a defining class-specific feature of glucocorticoid repression of paused genes. The dynamics of Pol 2 binding at non-paused genes, as shown in Figure 2, suggested that the major barrier to activation at these genes is the loading of Pol 2. BMDM surpass this barrier by recruiting NF-kB and AP1 to enhancer regions (Glass and Natoli, 2015) that in turn assemble histone-modifying proteins, which help create a more permissive chromatin environment for the binding of basal transcriptional machinery and Pol 2. In particular, histone tail modifications, which are associated with both enhancers and promoters are H3K9Ac and H4K5/8/12Ac (Smale et al., 2014). Because these marks correlate with gene transcriptional status, we evaluated the histone acetylation at a subset of our GC-repressed genes of each class. We noted striking differences in histone tail modifications between representatives of the two gene classes. In particular, paused genes - Tnf and Ccl2 - contained high basal levels of H4PanAc and, specifically, H4K5Ac, at both TSS- and kB-binding sites which were unaffected by LPS or LPS + Dex treatment (Figure 4A, bottom row). In contrast, non-paused genes - Il1b and Il1a - showed a significant increase in H4Ac levels only after LPS treatment, especially at the Il1b TSS and two Il1a kB enhancers at −10 Kb and −20 Kb, and this increase was fully attenuated by Dex (Figure 4A, top row). GR inhibits H4 acetylation, BRD4 and Mediator assembly at non-paused genes. (A) BMDM were treated as indicated, and H4PanAc, H4K5Ac and H4K12Ac at the TSS and indicated kB sites were assessed by ChIP. qPCR signals were normalized to r28S gene and expressed as relative enrichment over normal IgG (=1). A two-tailed Student’s t-test was used for comparing means (n ≥ 3; *p<0.05, **p<0.01). Error bars are SEM. (B) BMDM were pre-treated with I-BET (10 nM, 100 nM, 1 μM) for 30 min followed by addition of LPS for 30 more min. Gene expression was assessed by RT-qPCR and normalized to that of Actb. A two-tailed Student’s t-test was used for comparing means (n ≥ 3; *p<0.05, **p<0.01). Error bars are SEM. (C) BRD4 occupancy was assessed by ChIP-qPCR as in A with IgG ChIP as a background metric and expressed as relative enrichment over untreated for each site (=1). A two-tailed Student’s t-test was used for comparing means (n ≥ 3, *p<0.05, **p<0.01). (D) ChIP-seq read density profiles for BRD4, GR and p65 in the U, L or L + D treated BMDM. Purple arrows indicate peaks specifically noted in Results. (E) Venn diagrams show overlapping BRD4 peaks for Dex-repressed paused and non-paused genes in the U and L condition. Overlapping peaks were determined as described in Figure 1 and Materials and methods. (F) Med1 and Med12 occupancy is analyzed by ChIP-qPCR as in A (n ≥ 3). Also see Figure 4—figure supplement 1 and Supplementary file 2. The change in acetylation seen preferentially at our non-paused genes, appeared to denote a specific ‘histone code’ for histone binding proteins that could potentially affect the transcription of these genes. In particular, BRD4, the Bromodomain and Extra-Terminal domain (BET) histone binding protein, affects inflammatory cytokine transcription both in vitro and in vivo through direct binding to acetylated H3 and H4 (Shi and Vakoc, 2014). The changes in H4PanAc including H4K5/K12Ac in several GC-sensitive genes, suggested a possible role for BRD4 in transcriptional repression by GR. To test this hypothesis, we first assessed activation of pro-inflammatory genes by LPS in the presence of increasing concentrations of I-BET, an inhibitor of BRD4 binding. 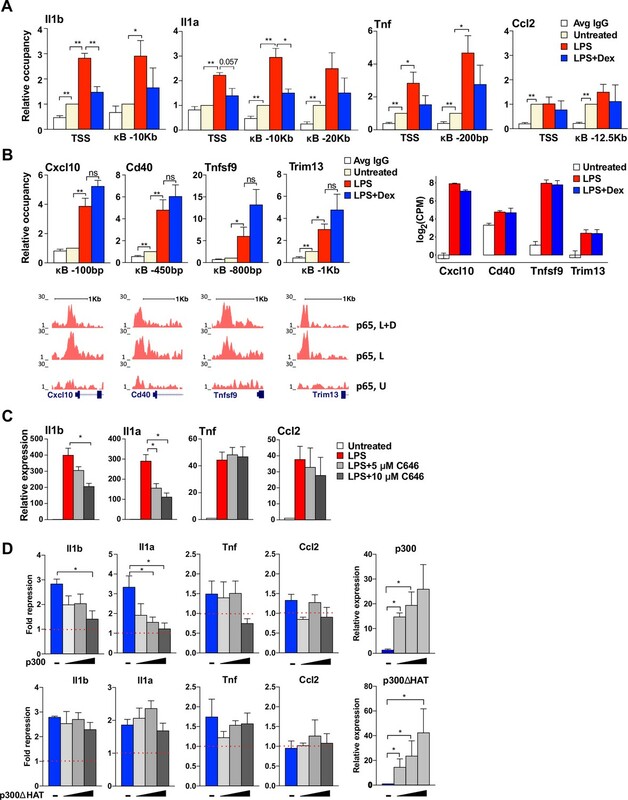 The induction of Il1b and Il1a transcripts was significantly attenuated by I-BET in a dose-dependent manner, whereas Tnf and Ccl2 induction persisted (Figure 4B). In agreement with gene expression results, ChIP-qPCR experiments revealed that BRD4 was recruited to promoters of non-paused genes Il1b and Il1a upon LPS treatment and, interestingly, this recruitment was attenuated by Dex (Figure 4C). Conversely, at the paused genes, Tnf and Ccl2, BRD4 was readily detectable at the TSS in unstimulated BMDM and this association did not significantly change after either LPS or LPS + Dex treatment. Thus, BRD4 occupancy patterns at the promoters of these genes resembled signal-responsive H4Ac profiles suggesting that loss of BRD4 in response to Dex may underlie GR-mediated repression of, specifically, the non-paused genes. We then assessed genome-wide distribution of BRD4 by ChIP-seq. Not surprisingly, we observed frequent BRD4 binding across the genome in untreated BMDM (~3700 peaks, Figure 4—figure supplement 1A, left panel). There was a 1.8-fold increase in the number of BRD4 peaks in response to LPS relative to that in untreated BMDM (4345 new peaks, Figure 4—figure supplement 1A, left panel). The increase in the total peak number was even more apparent when limited to LPS-induced genes: 2.9-fold for Dex-insensitive or -repressed genes (Figure 4—figure supplement 1A, middle and right panel, respectively). Furthermore, BRD4 loading density specifically at our Dex-sensitive genes increased dramatically in response to LPS which, interestingly, was nearly abrogated by Dex - a trend very apparent at promoters, but also significant at BRD4:p65 shared binding sites (Figure 4—figure supplement 1B). BRD4 read distribution at individual non-paused genes of interest reflected this dynamics. For example, the Il1b TSS and −2.3 Kb and −10 Kb p65 enhancers acquired strong BRD4 binding in response to LPS which was significantly attenuated by Dex, concomitantly with GR loading (Figure 4D, left top, purple arrows). Il1a also displayed increased LPS-induced BRD4 loading at kB-associated upstream enhancers (−10 Kb and −20 Kb) with a dramatic reduction in occupancy upon Dex co-treatment corresponding to GR binding at both regions (Figure 4D, left bottom, purple arrows). Consistent with our ChIP-PCR data, paused genes, Ccl2 (−12.5 kB enhancer) and especially Tnf (TSS) exhibited modest yet detectable BRD4 occupancy in untreated BMDM that was potentiated by LPS but only minimally affected by Dex (Figure 4D, right). Moreover, our analysis of BRD4 occupancy at Dex-sensitive genes of the two classes revealed that in paused genes, 45% of the BRD4-binding sites seen in LPS-treated BMDM were already pre-bound in untreated cells and 55% were LPS-induced; in non-paused genes, however, only 38% of the sites were pre-occupied in untreated BMDM, whereas 62% were LPS-dependent (Figure 4E). Thus, our functional studies together with occupancy data suggest that the activation of non-paused genes is more dependent on BRD4 recruitment, and therefore, its dismissal may have a greater impact on genes of this class. Initial BRD4 characterization revealed its interaction with the Mediator complex subunits MED1 and MED12 (Jang et al., 2005; Lovén et al., 2013). Mediator is an evolutionarily conserved multi-protein co-activator complex that facilitates transcriptional activation of many genes in part by linking physically and functionally effector TFs and Pol 2. In the context of LPS-induced activation of pro-inflammatory genes, MED1 is reportedly recruited to both the TSS and p65 enhancers (Hargreaves et al., 2009; Brown et al., 2014), occupying similar sites across the genome as BRD4, and the two appear to stabilize each other’s occupancy at enhancer regions (Lovén et al., 2013). We therefore assessed MED1 and MED12 occupancy at the promoters and p65 enhancers of GR-sensitive genes and found that both were recruited to TSS and p65 sites in response to LPS treatment and their recruitment was attenuated by Dex (Figure 4F). Thus, by inhibiting BRD4 binding to the TSS and certain enhancer regions at non-paused genes, GR destabilizes MED1 and MED12 occupancy ultimately affecting Pol 2 recruitment. Of note, MED1 and MED12 loss in response to Dex occurred at paused genes as well (Figure 4F), suggesting that GR may antagonize the Mediator complex binding irrespective of its effects on BRD4. GR activation disrupted histone acetylation and subsequent BRD4 and Mediator complex assembly at our analyzed non-paused genes, suggesting a central role for LPS-induced histone acetylation as a potential target for GR. 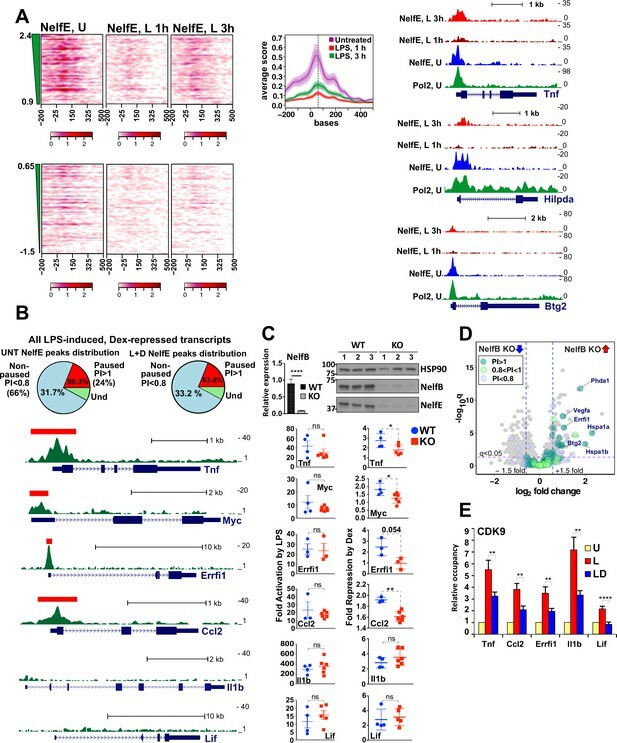 Various HATs, including GCN5 and p300, have been implicated in altering modifications at the histone H3 and H4 tails (Smale et al., 2014) Furthermore, p300 has been shown to also interact with and acetylate p65, which contributes to the activation of NF-kB-dependent genes (Huang et al., 2009; Nagarajan et al., 2014; Roe et al., 2015). Thus, p300 appeared as a plausible HAT to execute H3/H4 acetylation, thereby dictating the recruitment of BRD4 to the promoters and kB sites of our genes of interest. ChIP-qPCR experiments revealed LPS-dependent recruitment of p300 to the TSS- and p65-binding sites of non-paused genes Il1a and Il1b, which was blocked by Dex. Interestingly, at paused genes, p300 occupancy varied, showing some LPS-potentiated yet Dex-insensitive recruitment to Tnf, but a strong constitutive occupancy at Ccl2 (Figure 5A). Notably, loss of p300 from these genes did not reflect a simple ‘titration’ of p300 by the activated GR potentially broadly sequestering it away from kB enhancers, as p300 occupancy at the p65-binding sites of LPS-induced Dex-insensitive genes identified by our RNA-seq analysis - Cxcl10, Cd40, Tnfsf9, Trim13 - was fully resistant to Dex (Figure 5B). GR-mediated repression of non-paused genes is associated with the diminished p300 function. (A) p300 occupancy at indicated kB-binding sites is evaluated as in Figure 4C (n ≥ 3). (B) p300 occupancy at indicated kB binding sites is evaluated as in A (n ≥ 3; top panel). p65 ChIP-seq read density distribution in U-, L- or L + D-treated BMDM for corresponding kB-binding sites is shown (bottom panel). Expression level (log(CPM) values) for LPS-induced Dex-insensitive genes as determined by RNA-seq in Figure 1A for the WT BMDM (untreated, LPS 1 hr, L + D 1 hr, n = 2, right panel). (C) BMDM were treated with LPS for 30 min followed by addition of 5 μM or 10 μM C646 for another 1 hr. The expression of indicated genes was assessed as described in Figure 4B (n ≥ 3). (D) RAW264.7 cells were transfected with increasing amounts of pcDNA3-p300 or pcDNA3-p300(ΔHAT) (0, 50, 100 and 150 ng/well) as described in Materials and methods. Cells were treated with 100 ng/ml LPS ±100 nM Dex for 1 hr. Gene expression was analyzed as described in Figure 3C (n ≥ 3). We reasoned that p300 catalytic activity rather than its occupancy is a better indicator of whether or not this HAT is involved in regulating target GR-sensitive genes. Therefore, a selective and competitive inhibitor of the p300 HAT activity, C646, was used to determine whether p300-mediated acetylation of histones was necessary for transcriptional activation of candidate pro-inflammatory genes. C646 attenuated in a dose-dependent manner LPS-mediated induction of non-paused genes Il1b and Il1a, whereas activation of paused genes Tnf and Ccl2 was unaffected (Figure 5C), consistent with a selective requirement for p300 at the non-paused genes. Furthermore, if GR represses Il1a and Il1b specifically by precluding p300 recruitment, its ectopic introduction into cells should rescue LPS-mediated induction irrespective of GC treatment. Figure 5D shows that overexpression of wild-type p300 but not its ΔHAT mutant devoid of the catalytic activity in macrophage-like RAW264.7 cells dramatically and specifically reversed GR-mediated repression of non-paused genes. This suggests that GR represses these genes by precluding p300 recruitment, H3/H4 acetylation and the assembly of the BRD4-Mediator complex, ultimately blocking Pol 2 loading. Despite the unmatched therapeutic utility of GCs stemming in large part from rapid and direct transcriptional repression of the key inflammatory genes, our knowledge of the overall architecture, dynamics, stability and distribution of such repressive GR complexes in inflammatory cells has been lacking. Given fundamental differences in the rate-limiting events for inflammatory gene activation, we sought to dissect the mechanisms by which GR elicits repression in such distinct gene classes and use genome-wide approaches to assess the generality of our findings. Numerous studies in cell culture and cell-free systems implicated physical interactions between GR, NF-kB and AP1 family members in the inhibition of pro-inflammatory gene transcription (reviewed in [Sacta et al., 2016]) and indeed, we observe extensive co-localization of GR and the NF-kB subunit, p65, genome-wide and especially nearby Dex-repressed genes following short-term LPS + Dex co-treatment – conditions under which we observe rapid glucocorticoid repression. GCs did not cause global displacement of p65; in fact, the number on p65-binding sites in the presence of LPS vs. LPS + Dex is comparable. Moreover, 80% of p65 peaks associated with our Dex-repressed genes overlap in LPS- and LPS + Dex-treated BMDM. Interaction with p65 is further corroborated by the persistence of p65 peaks near our candidate Dex-repressed genes of both classes. With respect to GR binding, both globally and restricted to Dex-repressed genes, several observations point to a tethering mechanism. First, the predominant motifs enriched in GR peaks present uniquely under LPS + Dex conditions are those of NF-kB and AP1 and not the NR3C motif overrepresented in Dex-treated BMDM or peaks shared between the two cistromes. Second, when compared between an entire genome and restricted to Dex-repressed genes, the fraction of LPS + Dex unique GR-binding sites is increasing substantially from 68% to 81%. Third, the majority of the 201 Dex-sensitive genes are only repressed in LPS-activated macrophages, pointing to a requirement for NF-kB activation for GR recruitment. Indeed, the analysis of GR occupancy nearby our candidate Dex-sensitive genes of both classes reveals co-localized GR and p65 peaks associated with NF-kB enhancers under repressing LPS + Dex conditions and no GR binding in Dex-only - treated macrophages. Thus, although this is certainly not the only mechanism by which GR affects inflammatory gene expression (Rao et al., 2011; Uhlenhaut et al., 2013; Oh et al., 2017; Weikum et al., 2017a), tethering to p65 is a widespread regulatory mechanism that GR relies upon to elicit acute repression of pro-inflammatory genes in macrophages. How GR enacts repression appears to depend on the state of the target promoters prior to activation. At paused genes, Pol 2 is pre-loaded, bound by NELF and ‘stalled’ nearby the TSS, (Gilchrist et al., 2012). These genes have elevated levels of histone acetylation at the TSS, suggestive of an open chromatin state, which would favor constitutive Pol 2 loading and transcription initiation. Conversely, non-paused genes show little Pol 2 occupancy in unstimulated BMDM. Among our Dex-repressed genes, both classes were well represented: in a set of transcripts filtered for Pol 2 occupancy and used to calculate PI, 61 were paused and 82 were not; in a total pool of transcripts corresponding to LPS-induced Dex-repressed 198 genes, approximately 24% were paused (PI > 1) and 66% non-paused (PI < 0.8). This distribution matched closely that of genes that were LPS-induced but insensitive to Dex (23% and 70%, respectively), suggesting that GR does not display a preference for a specific gene type for repression. Given a critical role of NELF in establishing Pol 2 pausing (Gilchrist et al., 2008; Core et al., 2012), we evaluated the genomic distribution of NELF at our LPS-induced Dex-repressed genes in basal, activated and repressed state. This analysis revealed a striking correlation between Pol 2 promoter-proximal pausing and NELF occupancy. Indeed 81% of the paused genes had TSS-associated NELF peaks compared to only 44% on non-paused genes. As expected, NELF dissociated from Pol 2 after LPS treatment, presumably due to P-TEFb-mediated phosphorylation, enabling productive elongation. Although the rate of NELF dismissal varies depending on culture conditions and in our experience takes 30–60 min, this loss is consistently transient as NELF ‘re-loads’ onto the TSS of these genes despite continuous presence of LPS. We previously reported a highly dynamic occupancy of NELF at the Tnf promoter (Adelman et al., 2009), but a global synchronous reloading of NELF onto promoters of activated pro-inflammatory genes was unexpected. We envision that NELF re-loading may provide a tonic control of the inflammatory response by limiting further entry of Pol 2 into productive elongation (Aida et al., 2006), yet maintain genes poised for induction by preserving a nucleosome-depleted environment (Gilchrist et al., 2008; Core et al., 2012). A distinct mechanism of ‘tonic control’ of inflammatory gene expression was recently described for a transcriptional repressor Hes1 which limits the recruitment of P-TEFb and hence, NELF release and Pol 2 elongation (Shang et al., 2016). In that regard, it would be informative to examine the dynamics of P-TEFb and phosphorylation of the Pol 2 CTD at the promoters of these genes over the time frame of NELF recycling. Interestingly, paused genes were originally proposed to be fast and transient responders to inducing signals (Adelman et al., 2009; Rogatsky and Adelman, 2014); NELF reloading despite prolonged LPS exposure could potentially contribute to cessation of activation and establishing a ‘tolerant’ LPS-unresponsive state. More generally, our finding illustrates that the transcriptional landscape of macrophages during a sustained exposure to a signal, even in a course of a few hours, undergoes a significant remodeling and a secondary stimulus is likely to elicit variable responses depending on the exact timing of stimulation. Furthermore, given intrinsic macrophage plasticity, whereby a 12 hr treatment with a relevant signal (e.g. LPS or Dex) is sufficient to ‘polarize’ them to a distinct myeloid cell population – caution needs to be taken in interpreting results of ‘sequential’ treatments, which may document a response of a reprogrammed macrophage to a new signal rather that simple transcriptional antagonism or synergy. Under conditions of GC repression, we observed a broad failure of paused genes to release NELF concomitantly with inhibition of Pol 2 entry into productive elongation. Moreover, genetic disruption of NELF resulted in GC resistance of genes in this class establishing a causal relationship between NELF accumulation and GR-mediated repression. Interestingly, NELF was previously shown to participate in estrogen receptor (ER) alpha-mediated gene expression. ERa primarily affects Pol 2 post-initiation steps, whereby pausing is alleviated via hormone-induced recruitment of CDK9 to Pol 2 and NELF and their phosphorylation (Kininis et al., 2009). Given that NRs can dynamically affect P-TEFb occupancy and that P-TEFb recruitment to GC-sensitive genes is attenuated after GC treatment in this and earlier studies (Luecke and Yamamoto, 2005; Gupte et al., 2013), GR may block elongation by preventing P-TEFb recruitment, possibly through direct steric hindrance. Interestingly, in addition to phosphorylation, NELF has recently been shown to undergo ADP-ribosylation which also facilitates its release (Gibson et al., 2016). It would be informative to assess whether, similar to P-TEFb, ADP-ribosyl transferases that modify NELF are susceptible to regulation by GCs. Finally, a physical interaction between ERa and NELF has been documented at promoters of certain estrogen-activated genes, where NELF recruitment limits the response to hormone (Aiyar et al., 2004). Conceivably, NELF could also serve as a non-conventional ‘co-repressor’ recruited by GR to the promoter-proximal regions of pro-inflammatory genes in a gene-specific manner. Once recruited, NELF may no longer require GR and assume its known function in Pol 2 pausing. Whether GR-mediated repression involves either of these mechanisms remains to be elucidated. Interestingly, non-paused genes, such as Il1a and Il1b, exhibit low CpG content, stable nucleosome assembly at promoters, low levels of H3K9/14Ac in the basal state and low TBP occupancy (Ramirez-Carrozzi et al., 2009). This suggests that histone acetylation marks are required for chromatin remodeling which may pose a major barrier to the recruitment of Pol 2 at these genes. We show that an increase in H4Ac at promoters and kB sites in response to LPS correlated with Pol 2 recruitment, and GC attenuated these effects, suggesting that GR may repress these genes by acting upon factors that ‘write’ and ‘read’ histone marks. Among many HATs that modify H3 and H4, p300 is recruited by p65 to the TSS and NF-kB sites and has been shown to acetylate histones that are then bound by BRD4 (Huang et al., 2009; Brown et al., 2014; Nagarajan et al., 2014; Roe et al., 2015). Conceivably, GR attenuates p300 loading by competing for a tethering site on p65 as has been previously documented for IRF3 (Ogawa et al., 2005). We cannot exclude the possibility that additional HATs, that is, GCN5, contribute to writing H3/H4Ac at our GC-sensitive pro-inflammatory genes. Given its role as a histone binding protein that reportedly contributes to recruiting P-TEFb and couples the acetylation state at promoters and enhancers with Pol 2 elongation, a clear bias for LPS-induced novel sites of BRD4 recruitment and their sensitivity to Dex specifically at non-paused genes was unexpected. BRD4 binding at promoters broadly correlates with gene activation (Nicodeme et al., 2010; Lovén et al., 2013; Brown et al., 2014; Kanno et al., 2014). We now show that similar to I-BETs, GR inhibits, albeit indirectly, loading of BRD4 particularly at non-paused genes and, by exploiting their dependency on histone acetylation, disrupts interactions with Mediator, ultimately antagonizing Pol 2 recruitment and transcription initiation. Because this effect is far from uniform, and some p65/BRD4-bound LPS-induced enhancers are more sensitive to the effects of Dex than others, we speculate that a subset of p65-binding sites has greater functional consequences for gene activity. Identifying a subpopulation of ‘dominant’ enhancers whose BRD4 occupancy is a definitive predictor of transcriptional state, and correlating those with sites of GR recruitment would likely sharpen the differences in BRD4 behavior between the two gene classes. Finally, although the two classes of genes are activated and repressed through distinct mechanisms, the consequences of GR activation share commonalities including a failure to recruit P-TEFb and the Mediator complex. P-TEFb is required for gene activation post Pol 2 loading, so at non-paused genes failing to recruit Pol 2, P-TEFb loss would have little functional consequences. Conversely, a block in Mediator recruitment at both the TSS and kB sites could potentially contribute to repression of both classes of genes. Mediator is a multi-subunit complex that interacts with numerous activators and components of basal transcription machinery including Pol 2 (Malik and Roeder, 2010). With respect to non-paused genes, Mediator interacts directly with both BRD4 and p300, with Mediator and BRD4 stabilizing each other’s occupancy (Jang et al., 2005; Malik and Roeder, 2010; Shi and Vakoc, 2014). Furthermore, Mediator and p300 can act cooperatively to alter the chromatin landscape and facilitate PIC formation (Malik and Roeder, 2010). Although the contribution of Mediator to activation of pro-inflammatory paused genes needs further study, it has been suggested that Mediator may help recruit P-TEFb indirectly promoting pause release (Lu et al., 2016). Additionally, because kB sites are typically distant from promoters, and pro-inflammatory genes were proposed to be activated through DNA looping (Tong et al., 2016), Mediator (perhaps together with Brd4) may contribute to bridging promoters with NF-kB enhancers. Thus, it is tempting to speculate that by hindering Mediator assembly, GR globally disrupts promoter-enhancer communication thereby attenuating pro-inflammatory gene expression. BMDM were prepared from 8-to-10 week old mice as in Gupte et al. (2013). RAW264.7 cells were cultured in DMEM media (Corning, cat# 10–013-CV) supplemented with 10% fetal bovine serum (Atlanta Biologicals cat# S11550). Dex and LPS were purchased from Sigma. C57BL/6 mice (NCI, Charles River Laboratories), C57BL/6 LysM-Cre mice -/-:Nelfb fl/fl mice and their derivatives were maintained in the Weill Cornell Animal Facility in compliance with guidelines from the Weill Cornell Animal Care and Use Committee. 8-to-10-week-old male mice were used for bone marrow isolation. To create the NELF-B conditional KO strain, Nelfb fl/fl mice (with Nelfb exon 4 floxed [Amleh et al., 2009]) were bred to C57BL/6-derived LysM-Cre mice (Jackson Laboratories, 004781) to obtain double heterozygous LysM-Cre/wt:Nelb fl/wt (LysM-Cre-HET) animals. To create homozygous (LysM-Cre:Nelfb fl/fl) animals, we self-crossed LysM-Cre-HET mice. The genotype of the progeny was determined using PCR primers described in Amleh et al. (2009). LysM-Cre primers were obtained from Jackson Laboratories. BMDM were plated in 6-well plates at 2*106 cells/well. For BRD inhibitor experiments, cells were pretreated with I-BET (Calbiochem, 401010) for 30 min, followed by co-treatment with LPS (10 ng/ml). For p300 inhibitor experiments, cells were treated with LPS for 30 min, followed by co-treatment with C646 (Abcam, ab142163) for 1 hr. Concentrations of inhibitors are shown in Figure Legends. RAW264.7 cells were plated at 2*105 cells/well in 24-well plates and transfected ON using Turbofect (Thermo Scientific, R0531) as per manufacturer’s instructions. Cells were treated the following day as described in Figure Legends. Plasmids used are pcDNA3.1-p300, pcDNA3.1-300(HAT-) (Addgene, Plasmid #23252 and #23254, respectively) and pcDNA3.1 to equalize total amount of transfected DNA. Total RNA isolation from BMDM (Qiagen RNAeasy Kit), random-primed cDNA synthesis, and qPCR with Maxima Sybr Green/ROX/2x master mix (Fermentas) on StepOne Plus real time PCR system were performed using standard protocols. Data analysis was performed using the ddCT method. All data were normalized to Actb as housekeeping control. Primers are listed in Supplemental file 4. Whole cell extracts were prepared in RIPA buffer (10 mM Tris-HCl pH 8.0, 1 mM EDTA, 0.5 mM EGTA, 140 mM NaCl, 5% glycerol, 0.1% Na deoxycholate, 0.1% SDS, 1% Triton X-100). Immunoblotting was performed with rabbit polyclonal antibodies to NELF-B (Cell Signaling, 1:2000, 1489S), NELF-E (Proteintech, 1:2000, 10705–1-AP), HSP90 (Cell Signaling 1:200, 4874S). BMDM were treated for 45 min as specified in Figure Legends and single cross-linked in 1% methanol-free formaldehyde for 10 min at RT (AcH4) or double cross-linked using 2 mM disuccinimidyl glutarate (Proteochem, c1104) for 30 min followed by 1% methanol-free formaldehyde for 10 min at RT (CDK9, BRD4, MED1, MED12, p300). The reaction was quenched by 0.125 M glycine for 5 min. Cells were then washed with PBS, scraped and lysed for 10 min at 4°C in lysis buffer with protease inhibitor cocktail. The nuclear extracts were collected by centrifugation at 600*g for 10 min. Nuclei were then washed for 10 min at 4°C in wash buffer with protease inhibitors and collected as described above. Nuclei were lysed in lysis buffer for 10 min and sonicated to fragment chromatin using 15–18 cycles (30 s ‘on’, 30 s ‘off’) in a Bioruptor at 4°C. For CDK9, nuclei were sonicated with Covaris S220 Ultrasonicator according to manufacturer’s instructions (130 μl shearing buffer, 200 cycles/burst, 120 s, DF 10). Lysates were cleared by centrifugation at 14,000*g, 20 min, 4°C, and then incubated with normal rabbit IgG (Santa Cruz Biotech, sc-2027x), BRD4 (Abcam, ab84776 and Bethyl Laboratories, A3001-985A100), MED12 (Bethyl Laboratories, A300-774A), MED1 (Bethyl Laboratories, A300-793), p300 (Santa Cruz Biotech, sc-585X), Anti-AcH4 (Millipore, 06–866), Anti-AcH4K12 (Millipore, 07–595), Anti-AcH4K5 (Millipore, 07–327) and 40 μl of 50% protein A/G plus agarose (Santa Cruz Biotech, sc-2003) per reaction at 4°C ON. Beads were washed 4x with RIPA buffer and once with TE buffer. For CDK9, 5 μg of antibodies (Santa Cruz Biotech, sc-8338X or sc-13130X) were pre-bound to 40 μl of Dynabeads Protein A (Invitrogen), washed 2x with beads blocking buffer and incubated with lysates at 4°C ON; IPs were washed 6x with modified RIPA buffer containing 100 mM LiCl on a magnetic stand and once with TE buffer +50 mM NaCl.Each reaction was then incubated in TE + 0.5% SDS +200 μg/ml proteinase K (Invitrogen, 25530049) for 2 hr at 55°C, followed by 6 hr at 65°C to reverse crosslinks. DNA was purified using phenol-chloroform extraction and ethanol precipitation or using Qiagen PCR purification kit. Recruitment at binding sites was assessed by qPCR. All data at putative binding sites were normalized to 28S ribosomal RNA as control. Primers are listed in Supplemental file 4. For GR (Santa Cruz Biotech, sc-1004X), BRD4 (Abcam, ab84776) and p65 (Santa Cruz Biotech, sc-372X) ChIP-seq, nuclei were sonicated with Covaris S220 sonicator according to manufacturer’s instructions (130 μl shearing buffer, 200 cycles/burst, 120 s, DF 10). For Pol 2 (Santa Cruz Biotech, sc-9001X) and NELF-E (Proteintech, 10705–1-AP) ChIP-seq, cells were formaldehyde cross-linked and nuclei were sonicated as above to obtain fragments in 150–500 bp range. Input DNA was prepared from sonicated material saved prior to IP. Lysates were cleared by centrifugation at 14,000 rpm, 20 min, 4°C, and then incubated with respective antibodies using 40 μl of 50% protein A/G PLUS agarose beads (for GR, BRD4 and Pol 2) or 60 μl of Dynabeads (Invitrogen) (for p65) per reaction at 4°C ON. GR, BRD4 and Pol 2 IPs were then processed as described for ChIP-qPCR above. p65 IPs were washed 6x with modified RIPA buffer containing 100 mM LiCl on a magnetic stand and once with TE buffer +50 mM NaCl and processed as described for ChIP-qPCR above. The efficiency of ChIP was assessed by qPCR. The integrity and quality of DNA was evaluated with Bionalyzer 2100 (Agilent Technologies) before using 10 ng of material to prepare Illumina-compatible sequencing libraries using Illumina Truseq ChIP sample prep kit. Library preparation and sequencing was performed by Weill Cornell Epigenomics Core. Libraries were sequenced by a HiSeq 2500 (50 bp, single-end). BMDM from LysM-Cre:NELF-B wt/wt (WT) and/or LysM-Cre:NELF-B fl/fl (NELF-B KO) mice were treated as indicated in individual figure legends (vehicle, LPS, LPS + Dex for 1 hr) and RNA was isolated using Qiagen RNA-easy kit. Total RNA was polyA enriched and converted into Illumina-compatible sequencing library with TruSeq mRNA-Seq sample preparation kit (Illumina). Quality control of RNA and libraries was performed using the BioAnalyzer 2100. Pair-end sequencing was performed at the Weill Cornell Epigenomics Core using HiSeq2500. To ensure reproducibility all in vitro experiments were repeated at least in triplicates. The differences between continuous variables were assessed using Student’s t Test and the differences between discrete variable were assessed with Fisher’s exact test. Two-tailed Student’s t-test was used to ascertain the differences between means as detailed in Figure Legends. Sequencing quality control was performed using FASTQC; adapters, when needed, where trimmed using trimmomatic. 50 bp single-end reads were aligned to the mouse genome (mm10) using CLC Bio Genomic Workbench (GR, Pol 2) or bowtie2 (p65, NELF-E, BRD4). Aligned BAM files were converted into bigwig format for data visualization purposes. The quality of Chip-seq experiments was assessed using ChIPQC package (Carroll et al., 2014) (Supplemental file 2). Cross-correlation analysis, Relative Strand Correlation (RSC) and Normalized Strand Cross-correlation coefficient (NSC) for all ChIP-seq datasets used in this study were calculated with CLC BIO genomics workbench (Figure 1—figure supplements 1D and 2C; Figure 3—figure supplement 1A and Figure 4—figure supplement 1C, Supplemental file 2) as described in Marinov et al., 2014. RSC reflects the ratio of the fragment-size peaks and the read-size peak in cross-correlation plot. For all experiments with the exception of one NELF-E condition, the RSC is larger than 0.8 as per ENCODE recommendations (Landt et al., 2012). Peak calling was performed with CLC Bio Genomics Workbench (Pol 2) or MACS2 (Zhang et al., 2008) (--gsize 2150570000 --bw=300 ratio 1.0 --slocal 1000 --llocal 10000 --keep-dup 1 --bdg --qvalue 0.05) with a matching input file to estimate background read distribution. Peak annotation relative to known genomics features was performed using ChIPpeakAnno package (R, Bioconductor) (Zhu et al., 2010) with TxDb.Mmusculus.UCSC.mm10.knownGene annotation (2016-09-29 04:05:09 + 000). Peak overlaps between datasets were determined using subsetByOverlap function from GenomicRanges package (R, Bioconductor) with the minimum overlap of 1 nt and visualized with makeVennDiagram function from ChIPpeakAnno (Zhu et al., 2010) package. Ab initio analysis of overrepresented sequences in ChIP-seq peaks was performed using MEME-ChIP suite with MEME (long sequences), DREME (short sequences) and CentriMO (centrally-enriched sequences). E-values estimate the expected number of motifs in an experimental set of sequences compared to random sequences of the similar size. Sequencing motifs with E-values under 0.0001 were considered statistically significant. Pol 2 pausing indexes (PI) were calculated as previously described (Nechaev et al., 2010). All transcripts for LPS-induced Dex-sensitive genes present in TxDb.Mmusculus.UCSC. mm10.knownGene annotation were filtered to collapse all annotated transcripts with identical 5’ ends to a single gene model. For remaining transcripts, the PI was calculated as the ratio of log-transformed, length-normalized read counts at the 5’ end flanking region (−200:+500) and transcript ‘body’ (+500: end of a transcript). To compare between replicates, the PI were normalized to respective library sizes (as in Figure 2B). Read distributions in the region of interest (‘promoters’ and gene ‘bodies’) were visualized in the form of ‘heat’ maps that show scores (coverage) at a given sequence position or bin using genomation package (R, Bioconductor) (Akalin et al., 2015). 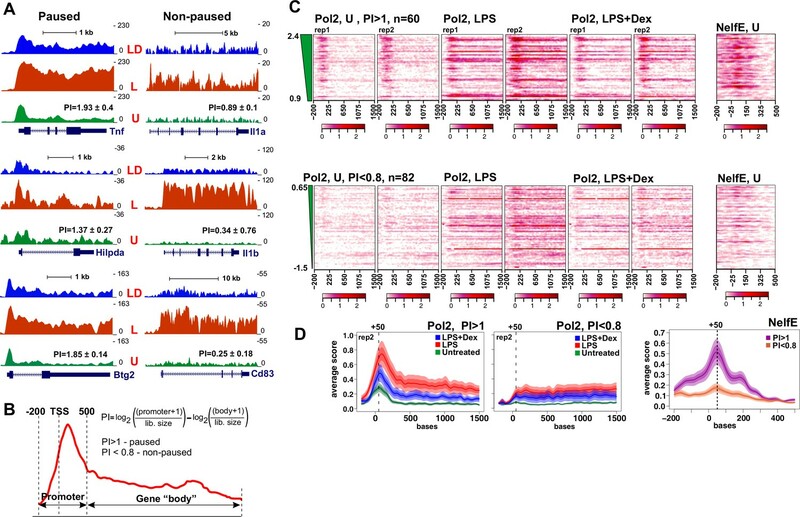 For heat maps visualization, paused and non-paused transcripts were further filtered by selecting only those that had overlapping Pol 2 peaks in the ‘promoter’ area in LPS-treated BMDM. To summarize read distributions, we plotted mean coverages (plotMeta, genomation) over regions of interest (Figures 2D and 3A and Figure 4—figure supplement 1B) with the standard error and the 95% confidence interval bands. RNA-seq analysis has been performed as previously described (Coppo et al., 2016). 50 bp paired reads were mapped to annotated mouse genome (mm10) with CLC Bio Genomic Workbench (Qiagen).Read count table containing unique exon reads was analyzed using EdgeR (Robinson et al., 2010) package to determine differentially expressed genes. Read counts were scale normalized using the weighted trimmed mean method and expressed as log-transformed counts per million (cpm). All genes with unadjusted p-value<0.01 (p<0.05 for NELF-B KO experiment) and fold change >1.5 in at least one pairwise comparison were considered to be differentially expressed and were selected for further analysis. Molecular and Cellular Biology 26:6094–6104. Molecular and Cellular Endocrinology 380:55–64. Molecular and Cellular Biology 29:1375–1387. Nature Structural & Molecular Biology 21:1047–1057. Molecular and Cellular Biology 29:1123–1133. Biochimica et Biophysica Acta 1809:34–45. Annual Review of Physiology 78:155–180. Cold Spring Harbor Perspectives in Biology 6:a016261. Annual Review of Immunology 32:489–511. Nature Reviews Molecular Cell Biology 18:159–174. Thank you for submitting your work entitled "Gene-specific mechanisms direct Glucocorticoid Receptor-driven repression of inflammatory response genes in macrophages" for consideration by eLife. Your article has been evaluated by a Senior Editor and three reviewers, one of whom is a member of our Board of Reviewing Editors. The following individual involved in review of your submission has agreed to reveal their identity: Iván D'Orso (Reviewer #3). The main findings were thought to be of general interest, but after considerable discussion among the Senior Editor, Reviewing Editor and reviewers, it was concluded that the essential revisions needed to substantiate the major conclusions would require significantly more than a two month time frame. The decision is therefore to reject the manuscript, but to include the distilled 'Essential revisions' resulting from editorial discussion in addition to the full individual reviews. The reviewers indicated willingness to consider a revised manuscript that adequately addresses these main concerns should you wish to pursue that option. Sacta et al. investigates the mechanisms of GC mediated repression on inflammatory genes. Using genome-wide approaches they identify the inflammatory gene set that is repressed by GCs. Based on PolII pausing index they identify inflammatory genes that are paused and become activated by the inflammatory stimulus by a mechanism involving the release of NELF. Genes that are not paused recruit PolII de novo, but both paused and not paused inflammatory gene groups are susceptible to GC mediated repression. GR seems to repress paused genes by depositing NELF, while at non-paused genes it inhibits the recruitment of p300, which will ultimately lead to a defect in BRD4 and Mediator assembly, diminishing transcription. Many prior studies have investigated GR repression, and there is substantial overlap in phenomenology reported here and the existing literature. The novelty relates to dividing GR repressed genes into those that are regulated at a pause-release step and those that are not. These findings are interesting, but there are a number of concerns about the strength of the main conclusions. These relate to reproducibility of genome-wide analysis, evidence for the tethering mechanism, relationship of GR binding to NELF occupancy, and interpretation of p300 over expression studies. 1) There do not appear to be replicates for ChIP-seq experiments. The authors use a cross correlation analysis method to estimate the quality of their ChIP-seq data, but this is not the same as evaluating reproducibility across experiments. The findings are probably sound with respect to peak locations, but the lack of replicates could be problematic when attempting to make quantitative comparisons and using arbitrary thresholds to divide features into one category or another. All three reviewers were of the opinion that replicates are required to make genome-wide conclusions, which are an essential aspect of this manuscript. The authors should provide a table indicating characteristics of each of the high throughput samples, including number replicates, number of uniquely mapped reads and for ChIP-seq experiments the fraction of reads in peaks. For replicates, the similarities of samples should be indicated e.g., by a Pearson correlation. 2) The authors identified 201 liganded GR-repressed inflammatory genes (Figure 1A). They suggest that the dominant mechanism of GR-mediated repression is rapid tethering of GR to LPS-activated p65. However, they did not show whether these GR-repressed inflammatory genes are sensitive or insensitive to receptor activation in Dex treated macrophages without inflammatory stimuli. Sensitivity to Dex in the absence of LPS stimulation would suggest a mechanism independent of tethering by NF-κB. 3) The tethering mechanism itself needs to be further substantiated. At this point, the evidence is based on poor enrichment of GRE sequences at sites associated with binding of p65. There is substantial prior evidence that GR can interact with NF-κB. An important question is whether GR is interacting at negatively regulated sites by tethering or by binding to unconventional GREs, which have also been suggested as a basis for negative regulation. This question may be difficult to address in the BMDMs in a reasonable time frame, but could be addressed by generating by using CRISPR/Cas9 approaches to introduce DNA binding mutants in the endogenous GR locus in the RAW system and performing ChIP-seq experiments under each experimental condition. (An alternative would be to study GR in BMDMs in the GRdim mice, if available). These experiments would clearly establish which binding events were dependent on the DNA binding domain and which were mediated by tethering. 4) The findings regarding the requirement of NELF for GR repression of paused genes are interesting, but more information is needed for interpretation. Does GR treatment prevent dismissal of NELF from paused promoters? Is there a consistent relationship between GR occupancy at the promoters of paused genes and the importance of NELF? How does NELF affect basal gene expression at paused inflammatory genes and intergenic enhancers? If NELF keeps these genes under pausing, in the absence of NELF at least in theory gene expression should increase. It would be helpful to provide the absolute levels of expression of these genes rather than fold change to enable a more complete assessment of the consequences of NELF deletion. 5) Further related to the pause-release mechanism, a study by Zhu et al. (Biochemistry 2011) showed that the master regulator of Pol II pause release (the Cdk9/P-TEFb kinase) is a competitive decelerator of GR transactivation activity and does not interfere with the inhibitory activity of NELF. What is the role of CDK9 on NF-κB and GR binding in the repression of inflammatory genes? Along the same line, one key relevant article (PMID 15879558) was not discussed in the context of the discoveries of this manuscript. In that paper, Luecke and Yamamoto published that GR blocks recruitment of the P-TEFb kinase by NF-κB to effect promoter-specific transcriptional repression. Is there any relationship between these previous discoveries and the mechanisms of LPS+Dex stimulation/repression discussed in this manuscript? 6) An old model for nuclear receptor-dependent repression of inflammatory response genes posited re-distribution of coactivators upon nuclear receptor activation. Here, most GR sites are not at NF-κB peaks and could potentially compete for the binding of p300 for gene activation. This mechanism would also result in loss of p300 at p65 peaks and be overcome by overexpression of wild type p300 but not mutant p300. Therefore, the experiments presented in Figure 5 do not clearly demonstrate that local tethering of GR is the cause of reduced p300 and histone acetylation at these sites. Examination of p300 and histone acetylation, etc., in a cell engineered to express a DNA binding mutant that cannot bind to specific DNA sites (and thus recruit p300 to these sites) but can still tether to NF-κB sites, as requested in point 3, above, would be needed to address this concern. The manuscript from Sacta and colleagues reports on the analysis of dexamethasone (dex) mediated repression of genes upregulated upon LPS stimulus either by release of the paused RNA polymerase II or de-novo recruitment thereof. They find that both, control of RNAP II elongation or de-novo recruitment are equally susceptible to GR repression. The authors present evidence of GR-binding to p65 sites upon LPS treatment and reduced dex-induced repression of paused genes upon NELF depletion, a factor pivotal for Pol II pausing. In addition, they provide evidence for the opposition of p300, BRD4 and GR. The findings regarding two distinct mechanisms for GR repression are of general interest, but some of the main conclusions are not yet sufficiently established. The findings regarding the requirement of NELF for GR repression of paused genes are interesting, but more information is needed for interpretation. Does GR treatment prevent dismissal of NELF from paused promoters? Is there a consistent relationship between GR occupancy at the promoters of paused genes and the importance of NELF? What happens to the basal expression of these genes? Are they still induced by LPS or do they become constitutively activated? It would be helpful to provide the absolute levels of expression of these genes rather than fold change to enable a more complete assessment of the consequences of NELF deletion. For the RNAseq, a rational for the relatively relaxed conditions of an FDR to 0.1 and using a 1.5-fold change should be presented. How far did the additionally obtained genes improve the findings compared to the more commonly utilized i.e. FDR 0.05 and >2 fold? A more detailed description of the rationale and used parameters would benefit the methods. The authors do not relate the present findings to their earlier studies indicating a requirement for GRIP1 in repression of LPS-dependent gene expression. Is there any relationship to GRIP-dependent repression and either class of genes (paused vs. non paused)? An old model for nuclear receptor-dependent repression of inflammatory response genes posited re-distribution of coactivators upon nuclear receptor activation. Here, most GR sites are not at NF-κB peaks and could potentially compete with p300 for gene activation. This mechanism would also result in loss of p300 at p65 peaks and be overcome by overexpression of wild type p300 but not mutant p300. Therefore, the experiments presented in Figure 5 do not clearly demonstrate that local tethering of GR is the cause of reduced p300 and histone acetylation at these sites. Some alternative approach would be needed, e.g., a DNA binding mutant that cannot bind to specific DNA sites (and thus recruit p300 to these sites) but can still tether to NF-κB sites. There do not appear to be replicates for ChIP-seq experiments. The authors use a cross correlation analysis method to estimate the quality of their ChIP-seq data, but this is not the same as evaluating reproducibility across experiments. The findings are probably sound with respect to peak locations, but the lack of replicates could be problematic when attempting to make quantitative comparisons and using somewhat arbitrary thresholds to divide features into one category or another. The authors should provide a table indicating characteristics of each of the high throughput samples, including number of uniquely mapped reads and for ChIP-seq experiments the fraction of reads in peaks. For replicates, the similarities of samples should be indicated e.g., by a Pearson correlation. In the absence of replicates, the key findings from ChIP-seq need to be confirmed at informative loci for representative genes. The manuscript would benefit from a discussion of previous findings including the physical interaction of NF-κB and GR upon GR translocation (Ray laboratory and others, i.e. doi: 10.1073/pnas.91.2.752). Treatment with alternative ligands such as RU486 which facilitates GR translocation but negligible activity to inhibit NF-κB transactivation would strengthen the claim of GR tethering at the described sites. The novelty of the finding is at this point not entirely clear and could benefit from a more thorough discussion of previous publications, particularly those from the Simons lab (doi: 10.1074/jbc.M115.683722 and most notably 10.1074/jbc.M115.683722), in which Brd4, NELF etc. are implicated in GR activation. Sacta et al. investigates the mechanisms of GC mediated repression on inflammatory genes. Using genome-wide approaches they identify the inflammatory gene set that is repressed by GCs. Based on PolII pausing index they identify inflammatory genes that are paused and become activated by the inflammatory stimulus by a mechanism involving the release of NELF. Genes that are not paused recruit PolII de novo, but both paused and not paused inflammatory gene groups are susceptible to GC mediated repression. GR seems to repress paused genes by depositing NELF, while at non-paused genes it inhibits the recruitment of p300, which will ultimately lead to a defect in BRD4 and Mediator assembly, diminishing transcription. The manuscript offers some new insights about the mechanisms of GC mediated repression of inflammatory genes, however the tethering mechanism proposed for GR recruitment at GC repressed sites is not convincing and experimentally not confirmed. In the absence of this the enthusiasm of this reviewer is rather low, because the issue of GR mediated transcriptional repression has been addressed by many papers and this represents only an incremental advance. In addition the reviewer feels that the first part of the Results section is way too lengthy/complicated and contains more figures (motif enrichment analysis) that are not necessarily helping the main finding of the paper. Also the reviewer did not find any information about the number of replicates for the ChIP-seq experiments and there is no accession number provided to access sequencing datasets. The authors should provide a summary table containing all the next generation sequencing datasets. 1) The authors identified 201 liganded GR-repressed inflammatory genes (Figure 1A). They suggest that the dominant mechanism of GR-mediated repression is to rapid tethering of GR to LPS-activated p65. However, they did not show whether these GR-repressed inflammatory genes are sensitive or insensitive to receptor activation in Dex treated macrophages without inflammatory stimuli. 2) The authors suggested that 111 new GR peaks appeared in association with GR-repressed inflammatory genes in LPS+Dex treated macrophages (Figure 1E). In addition, they presented some representative examples of these peak set on Figure 1F. However, Dex treated sample is missing on this figure. 3) Figure 1E suggests that in the proximity of Dex repressed genes, GR peaks enrich the motif of the receptor conflicting with the proposed tethering mechanism. The authors should clarify this and provide experimental evidence if the repression predominantly takes place via tethering. 4) The read distribution plot-based visualization of different GR peak sets (on Figure 1B, C and E) is also necessary in untreated, LPS, Dex and LPS+Dex-treated macrophages. 5) The authors should be more careful with the title of Figure 1. "GR represses LPS-induced genes via p65-assisted tethering". Figure 1 neither does establish p65 as the main factor implicated in this, nor does provide evidence for the tethering mechanism (just by looking at motif enrichments one cannot claim that tethering is the main mechanism because of the absence of the GR motif). How do the authors know the relative contribution of p65 or other inflammatory transcription factors (AP1) to this "tethering"? Also if this is tethering, due to the fact that GR indirectly binds to these regions, I would expect to see smaller read enrichments (peaks) compared to regular, directly DNA bound GR sites. 6) On Figure 1E. it seems that the vast majority of the GR binding sites are formed also in the absence of LPS, suggesting that GR independently of LPS can act at these sites. How does Dex pre-treatment followed by LPS stimulation affect gene expression at these loci? How does Dex treatment alone affect inflammatory gene expression at the basal state? 7) On Figure 1E, are these GR peak categories overlap with p65 binding? The authors should make a schematic representation about the annotation process for easy understanding. 8) The authors claim that p65 binding is not affected by Dex, however there is no genome-wide analysis to back this claim. If the authors determined the RPKM values for p65 peaks on the regions identified on Figure 1D (Dex-repressed distal intergenic regions or other regions in this group) under the conditions presented would clarify if p65 binding indeed did not change. 9) The authors showed that the promoter regions of "paused" inflammatory genes were associated NELFE binding in absence of inflammatory stimuli. They described, that NELFE binding was decreased at these promoters after 1 hour LPS treatment. They suggest, that this factor also plays central role in GR-mediated repression. However, they did not show the deep comparison of NELFE binding between the unstimulated, LPS, Dex and LPS+Dex-stimulated macrophages at the promoter regions of all "paused" inflammatory genes (using read distribution plot-based visualization) or at the selected genes. 10) The authors described that 4 selected LPS-induced genes were repressed in a NelfB-dependent manner by Dex. How many genes do show similar NelfB dependency from the identified 201 liganded GR-repressed inflammatory genes? 11) Is the p65 binding regulated at the "paused" and "non-paused" inflammatory genes-associated enhancers/promoters by Dex? 12) Are the histone acetylation and p300 binding are regulated at the "non-paused" inflammatory genes-associated promoters/enhancers in the absence of inflammatory stimuli by GR activation? 13) How does NELF affect basal gene expression at paused inflammatory genes and intergenic enhancers? If NELF keeps these genes under pausing, in the absence of NELF at least in theory gene expression should increase. 14) How the absence of NELF affects the recruitment of p65 and GR at paused genes? Is it possible that pause release can negatively affect the recruitment of p65 or GR upon co-stimulation? 15) How Dex treatment affects NELF occupancy? Is it possible that GR activation deposits more NELF to inflammatory genes/enhancers and quenches future LPS response? In this manuscript Sacta et al. have utilized genome-wide and cell-based approaches to define mechanisms of glucocorticoid receptor (GR)-mediated repression of inflammatory genes in response to Dex treatment. GR potently represses the synthesis of inflammatory genes but the underlying mechanisms remained poorly understood. The authors used mouse bone marrow-derived macrophages treated ex vivo with LPS (to trigger the inflammatory program) and LPS+Dex co-treatment (to induce GR-mediated repression) as a system to tackle this scientific problem. They first classified GR target genes as paused and non-paused using an RNA Pol II pausing index criteria. While paused genes are activated by promoting Pol II pause release through eviction of the negative elongation factor NELF, non-paused genes are regulated by de novo Pol II recruitment to target promoters. The data suggests that GR does not preferentially repress genes in one-class vs the other. In addition, given that most of the GR regulated genes contain statistically enriched NF-κB (p65 subunit) binding motifs (as inferred from ChIP-seq data), the authors proposed a model in which the dominant repressive mechanism for both cases involves rapid GR 'tethering' to NF-κB. However, although the genomics data is convincing there is no evidence for the proposed recruitment mechanism and then the manuscript moves away from this central point to further define the molecular bases of the mechanism of activation and repression at both classes of genes (role of NELF on GR repression, role of histone acetylation, BRD4/Mediator recruitment to promoters, and p300 recruitment/activity). Striking differences between paused and non-paused genes were observed. While paused genes contain high-level of acetylation, non-paused genes do not but show a significant increase after LPS treatment, effect that was attenuated by Dex. They then analyzed the genome-wide distribution of BRD4 by ChIP-seq, but this section is confusing, not very well elaborated or integrated with other sections in the manuscript. Finally, using a pharmacological approach, the authors proposed a function for p300 in the LPS-mediated activation of non-paused genes but not of paused genes, and that GR represses non-paused genes by precluding p300 recruitment, histone acetylation, BRD4 recruitment and Pol II loading. The study seems an extension of several others that have examined the transactivation and trans-repression roles of GR. Nevertheless, it has several interesting findings on how GR mediates its repressive effects and provides further insight into the potential cross talk between NF-κB and GR in the regulation of transcription. However, the implications of these findings in the context of inflammation/innate immunity, and key genetic evidence for the 'tethering' mechanism, are lacking. While the manuscript has novel and interesting observations, several points require further clarification and experimental support as indicated below. 1) It would be critical (especially for the reader not familiar with the system used in this manuscript) to explain why the authors used co-treatment (LPS+Dex) rather than pre-treatment with Dex to exert transcriptional repression prior to the LPS shock. There has to be a biological explanation that is not apparent in the text. 2) The conclusion that Dex repression of all 'paused' genes is attenuated upon loss of NELF is expected if GR functions through NELF, but there is no direct evidence supporting the model. 3) The final conclusion of section 1 arguing that NF-κB is a critical component of repression complexes is interesting but the model has not been tested. This is inexplicable. Previous studies have shown that GR interacts directly with the p65 subunit of NF-κB. Thus, do GR and NF-κB associate in order for GR to elicit its repressive effects? If so, it is unclear in the manuscript and must be highlighted. Then the manuscript transitions to an interesting topic (the role of NELF in GR repressive effects) but unrelated to the initial observations. This rough transition makes to think that the two parts were forced. 4) A study by Zhu et al. (Biochemistry 2011) showed that the master regulator of Pol II pause release (the Cdk9/P-TEFb kinase) is a competitive decelerator of GR transactivation activity and does not interfere with the inhibitory activity of NELF. What is the role of CDK9 on NF-κB and GR binding in the repression of inflammatory genes? Along the same line, one key relevant article (PMID 15879558) was not discussed in the context of the discoveries of this manuscript. In that paper, Luecke and Yamamoto published that GR blocks recruitment of the P-TEFb kinase by NF-κB to effect promoter-specific transcriptional repression. Is there any relationship between these previous discoveries and the mechanisms of LPS+Dex stimulation/repression discussed in this manuscript? Reproducibility is certainly important, and we would like to clarify what constitutes a single ChIP-seq run for us when dealing with primary BMDM. A typical single 4-condition ChIP experiment requires bone marrow isolated from 4-6 mice. To then obtain enough sonicated ChIP material in 150-250 nt DNA fragment range for a sequencing experiment, we have to pool 3 to 8 (for particularly difficult cofactors or tethered GR) individual ChIPs (biological replicates), all of which are quality-controlled and have confirmed enrichments in expected locations by qPCR. This means, we need macrophages derived from 15 to 40 mice for a single 3-4-condition sequencing run. If we face a misfortune of the working antibody being discontinued (or Santa Cruz Biotech de facto going out of business), we have to start optimizations from scratch. This is what we have been doing over the past 5 months. Our original manuscript contained replicate ChIP-seq runs for Pol 2. The revision contains 2 new 4-condition replicates for GR, a new 3-condition replicate for p65, and a new 3-condition replicate for Brd4. New data are integrated into revised Figure 1B-E, Figure 1—figure supplements 1–2, Figure 4D-E, Figure 4—figure supplement 1. The requested similarities of replicates for GR, p65, Pol 2 and Brd4 are specifically shown in Figure 1—figure supplements 1A and 2A, Figure 3—figure supplement 1A and Figure 4—figure supplement 1C, respectively. We include new Supplementary file 2that specifies additional ChIP-seq quality control metrics, as requested; the last column of this table details the number of individual biological replicate ChIPs that were pooled for each ChIP-seq run because we believe this information enables one to gauge the scale of these experiments. At this point, the only unreplicated ChIP-seq is for NELF-E, because the original antibody is also no longer available . So we would have to re-optimize our ChIP protocol to yet another new antibody and perform both new ChIP-seq repeats (~8 individual 4-condition ChIPs). While this is doable, it would require at least 2 more months and, given how many additional experiments and at what cost we have completed (combined with the fact that thus far, the repeats have not challenged any of the original conclusions), we hope our reviewers will accept the NELF-E runs (composed of 2-3 experiments each) as they are. These two points are related, therefore, we address them below together. We agree that indeed, binding to NF-κB sites in the absence of LPS stimulation (and hence NF-κB binding) would imply an alternative mechanism for GR recruitment. It should be noted, that a number of inflammatory genes are co-regulated by NF-κB and AP1, and certain level of basal/uninduced cJun binding seen in most cell types can potentially provide tethering surface to GR in the absence of additional stimulation. Importantly, inflammatory signaling is known to antagonize GR DNA binding and gene regulation due to both transcriptional and signaling mechanisms (see, for example, Rogatsky et al., PNAS 1998; Chinenov et al., BMC Genomics 2014). Thus, if GR represses our genes through direct DNA binding, it is expected to do it MUCH better in a Dex-alone condition. RNA-seq experiments reported here did not include Dex-alone condition, however, our published BMDM RNA-seq analysis (Chinenov et al., PNAS 2012; Chinenov et al., BMC Genomics 2014) did include untreated and 1-h Dex-alone condition. We analyzed the data for our 201 genes and found that only 56 were repressed (1.3-fold threshold), and only 16 were repressed ≥2-fold. These data strongly argue for the necessity of inflammatory signal and LPS-induced p65 activation for recruiting GR, and certainly, against competitive binding. An additional column specifying the ability of GR to repress our 201 genes in the presence of Dex alone has been added to the revised Supplementary file 1. Next, we re-analyzed motif enrichment given new datasets incorporated into the study. As detailed in Results, the striking part of the analysis is that within a new class of GR binding sites gained specifically in response to LPS (LPS+Dex – unique sites), relative to Dex – unique or Dex: LPS+Dex – overlapping, is the NF-κB motifs, whereas GREs are not enriched. In contrast, the GR Dex – unique or Dex: LPS+Dex – overlapping peaks reveal the GREs and lack NF-κB enrichment (revised Figure 1C). We now also added Dex-alone GR ChIP-seq read density distributions in revised Figure 1F(Tnf, Il1b, Il12b, Cd83): new tracks demonstrate that GR binding peaks appear ONLY in LPS+Dex condition and perfectly overlap p65 peaks; no GR binding is seen in Dex-alone-treated BMDM. We see a similar LPS+Dex – specific GR binding by regular ChIP in both BMDM and human macrophage-like THP1 cells (Rollins et al., Nature Commun 2017 – Figure 6D-E https://www.nature.com/articles/s41467-01701569-2). Additional sites of GR and p65 co-binding at NF-κB enhancers in LPS+Dex-cotreated BMDM are shown in revised Figure 4D. Thus, binding data are consistent with the failure of the majority of these genes to be repressed by GR in the absence of inflammatory stimulation and NF-κB binding. Of course, using ‘uncoupling’ mutants has been attempted many times over 25 years since tethering has been first described, but turned out to be less straightforward than one would wish. The X-ray structures of GR bound to NF-κB are not as yet available, but GR DBD is well documented to be required for this interaction (see, for example, Nissen and Yamamoto, Genes and Dev. 2000); many mutations that affect GR DNA binding also affect these protein:protein interactions as well as GR DNA binding specificity. Using the infamous GR Dim mutant (and Dim-expressing BMDM), for example, is not a viable strategy as the mutant has been historically misrepresented as ‘DNA binding-deficient’ and even ‘activation-deficient’, when later work revealed that it is a complex gain-of-function transcription factor with altered DNA binding specificity, perfectly able to still bind to and regulate a subset of WT GR targets as well as NEW genes not regulated by the WT GR (Schiller et al., Genome Biology 2014). In addition, RAW cells brought up in reviews are extremely genetically unstable; every lab utilizes their favorite ‘strain’ of RAW cells which bear little resemblance to gene expression patterns of the primary macrophages and rapidly evolve in culture over as little as a few passages precluding a ‘stable line selection’ approach. Upon consulting with the editors, we decided to introduce tagged versions of WT vs. DNA-binding-deficient GR of choice into immortalized (i) BMDM and to examine their recruitment to a few induced vs. repressed genes by ChIP. It was agreed that we would not be able to analyze activities of these mutants given the presence of endogenous GR in iBMDM, but occupancy should be sufficient in light of extensive evidence for tethering described above. We created HA-tagged versions of WT hGR and two DNA-binding domain mutants C421G and K442E (https://www.ncbi.nlm.nih.gov/pubmed/3191531; https://www.ncbi.nlm.nih.gov/pubmed/16239257) in which the 1st Zn finger and the 1st helix of the DNA recognition motif, respectively, were disrupted. We packaged these GR derivatives into lenti-viruses using HEK293T cell-packaging line and transduced iBMDM to select for expressors by FACS based on the dsRed2 fluorescent protein-encoding gene in the vector (EF.CMV.RFP https://www.ncbi.nlm.nih.gov/pubmed/12788657 – Addgene). We discovered through multiple attempts, however, that iBMDM shut down ectopic GR expression while retaining dsRed2 fluorescence. As an alternative strategy then, we switched to GR-negative U2OS cells that would at least enable us to assess both activity and binding of GR proteins in the same context. We recognize that this experiment in non-immune, human cells with transiently transfected GR is quite a departure from the primary BMDM work which remains the central goal of our study, and therefore present as supporting ‘proof-of-principle’ data for the reviewers in this rebuttal (Author response image 1). GR DNA-binding mutants are competent for repression at NF-κB GR-tethering sites. U2OS cells were transfected with hGR (WT, C421G or K442E)-expressing or empty EF.CMV.RFP vector (a, left) using Lipofectamine 3000 (ThermoFisher) and treated the next day with vehicle (Veh), 100 nM Dex, 5 ng/ml TNF or TNF+Dex, as indicated. (a) Gene expression of GR-activated IGFBP1 and GILZ (middle) or GR-repressed TNF and IL8 (right) following 2 h treatment was assessed by RT-qPCR with b-Actin as housekeeping control. IGFBP1 (n=5) and GILZ (n=4) fold induction by Dex is expressed over transcript level in veh-treated cells (=1). TNF and IL8 expression (n=3 each) is calculated relative to the transcript level in TNF-treated cells (=1). (b) ChIP with polyclonal antiGR Abs (PA1-511A ThermoFisher) was performed following 2-h Dex (left) or 1-h TNF or TNF+Dex (right) treatment, and GR occupancy was assessed at GREs and NF-κB sites at indicated genomic locations with signals at 28S ribosomal gene as normalization control (n=3). Occupancy is expressed over baseline in veh-treated cells (=1). Error bars are SEM; 2-tailed Student’s t-test. As expected, both mutants display severely compromised ability to activate known GR target genes IGFBP1 and GILZ that are induced by the WT GR in Dex-treated U2OS cells (Author response image 1A, left and middle). In contrast, the NF-κB target genes TNF and IL8 that are activated by TNF (TNF, a physiological inducer of NF-κB activity, is used instead of LPS because U2OS cells are not very LPS-responsive due to poor expression of TLR4) were repressed similarly by the WT GR and its DNA-binding mutants (Author response image 1A, right). Upon scaling up transfection experiments for ChIP, we were able to detect WT GR, but not DNA-binding mutants, at the two GREs of IGFBP1 and at GILZ after 2-h Dex exposure (Author response image 1B, left). In contrast, all three GR derivatives occupied NF-κB sites of TNF and IL8 upon 1-h TNF+Dex treatment (Author response image 1B, right), further corroborating a tethering model in which p65 is a critical component of GR repression complexes, even in this heterologous experimental system. We apologize if we did not make this clear. Indeed, failure to dismiss NELF is a key component of GR repression of genes in the paused class. Genome-wide NELF occupancy in LPS+Dex (repressed) BMDM is indistinguishable from that seen in resting macrophages, so ‘paused’ configuration (which is rapidly disrupted when NELF is released in response to LPS) instead persists in the presence of LPS+Dex (Figure 3B). We agree that a priori, one may expect that the loss of NELF (NELF-B KO) would release paused Pol II leading to ‘leaky’ expression; however, an equally plausible scenario is that NELF ‘concentrates’ initiated transcriptionally engaged Pol II at the TSS, in which case its loss leads to the loss of Pol II and the baselines would be unaffected or even drop in NELF-B KO. In our system, we see no broad effect of NELF deletion on our genes of interest in resting BMDM (which is consistent with NELF-B KO mice lacking any appreciable phenotype in the absence of challenge). For the 6 genes we analyze quantitatively by RT-qPCR, we now include their baselines in WT vs. NELF-B KO BMDM from RNA-seq (new Figure 3—figure supplement 1C; n=2 each; also see datasets at GSE110279). With respect to their regulation, we now provide for clarity the induction levels for each (which are also unaffected by NELF deletion at the time point of the assay) next to their repression by Dex (revised Figure 3C). We note, however, that the effects of NELF on the induction of inflammatory transcriptome is a separate line of investigation pursued by many laboratories including ours: these are complex, dynamic and gene-specific and lie outside of the scope of this study. Here, we have chosen the time point of analysis at which our genes of interest are induced equally in both genotypes which enables us to specifically assess the effect of NELF on repression. Furthermore, we now performed RNA-seq in WT and NELF-B KO BMDM exposed to 1-h LPS+Dex (n=3 each genotype; GSE110279). 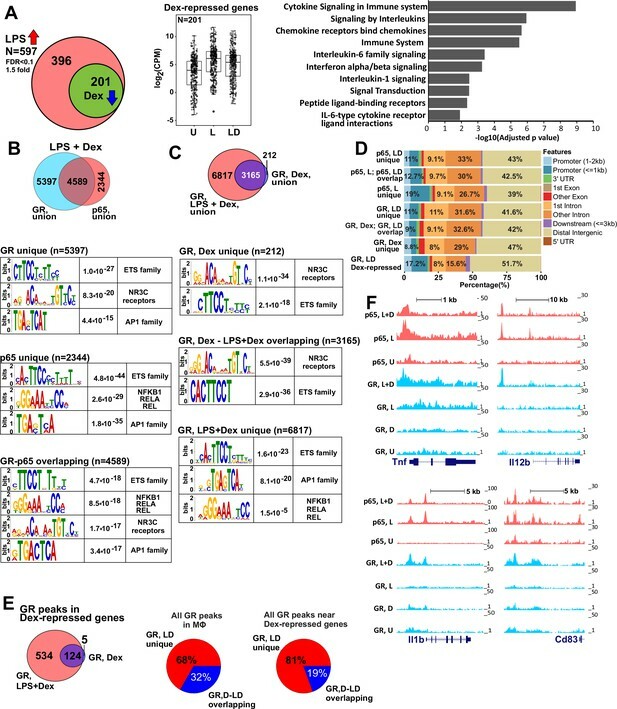 New Figure 3D shows that a number of LPS-induced Dex-repressed genes are expressed at higher levels (derepressed) in NELF-B KO and nearly all of them belong in the paused class. This is a striking result given that RNA-seq generates a different kind of data and quantifies all RNA not just nascent unprocessed transcripts as we usually evaluate by RT-qPCR; yet this gene class-specific trend held up to genome-wide analysis. As control, we do not observe such differential expression for LPS-induced Dex-insensitive genes (new Figure 3—figure supplement 1D). Thank you for pointing this out; we did mention the connection to CDK9 in Discussion, but it is a good idea to make it stronger. We are happy to cite the Luecke and Yamamoto (2005) work along with our Gupte et al. (2013) paper. Our main observation is that CDK9 recruitment to LPS-induced genes is greatly inhibited in the presence of Dex, however, this occurs irrespective of the gene class. We include a new Figure 3Ethat evaluates CDK9 occupancy at the same genes whose expression we assess in Figure 3C. Given that NELF rather than CDK9 was a critical distinction between paused and non-paused gene regulation, we focused our efforts on the former. That said, we are open to the possibility that multiple mechanisms contribute to NELF retention: failure to be phosphorylated by CDK9 is a valid mechanism as well as physical interactions between NELF and other components of the GR repression complex. We added requested information to revised Results and Discussion. Indeed, we are familiar with the heavily debated ‘competition for CBP/p300’ model and the subsequent studies arriving at very different conclusions. We appreciate the suggestion of using GR mutants however, this will create a new, stoichiometrically and biochemically intractable experimental system; in addition, it is unknown whether GR even needs to be DNA-bound to recruit p300 and evaluating the ability of any mutants to interact with p300 would constitute a project way out of scope of this study. Instead, we proposed another solution – as agreed upon by the Editor – which addresses the same concern within the same primary unmanipulated BMDM in a cleaner way. Indeed, if GR activation simply creates a ‘cofactor sink’, then p300 will be broadly evicted from most/all LPS-induced p65 targets. Hence, we analyzed the recruitment of p300 to the p65 binding sites of LPS-induced genes that were resistant to the effects of Dex. We now show that LPS-induced Dex-insensitive genes retain p300 at their p65 binding sites. Their expression (from our original RNA-seq), p65 ChIP-seq read density distribution and p300 ChIP-qPCR data (in the 3 experimental conditions each) are shown as a new Figure 5B. We are grateful to CE Mason and JA Gandara (Weill Cornell) and S Mimouna (HSS) for technical help. We acknowledge help from the A Alonso, Y Li and the staff of Weill Cornell Epigenomics core. We thank S Mimouna for helpful discussion. MAS is supported by the NIH Diversity Supplement 3R01DK099087-01A1S1 and the MSTP grant T32GM007739 from the NIH NIGMS to the Weill Cornell/ Rockefeller/ Sloan-Kettering Tri-Institutional MD-PhD Program. This work is supported by the grants to IR from NIH R01DK099087, the Rheumatology Research Foundation Research Grant, the DOD CDMRP PR130049 Research Award and The Hospital for Special Surgery David Rosensweig Genomics Center. XH is supported by the Ministry of Science and Technology of China National Key Research Project 2015CB943201, National Natural Science Foundation grants 81422019, 81571580, 91642115, 8151101184, and funds from Tsinghua-Peking Center for Life Sciences. RL is supported by the NIH R01CA220578. Animal experimentation: This study was performed in strict accordance with the recommendations in the Guide for the Care and Use of Laboratory Animals of the National Institutes of Health. Mice were maintained in the Weill Cornell Animal Facility in compliance with guidelines from the Weill Cornell Animal Care and Use Committee (Protocol approval # 2015-0050). © 2018, Sacta et al.